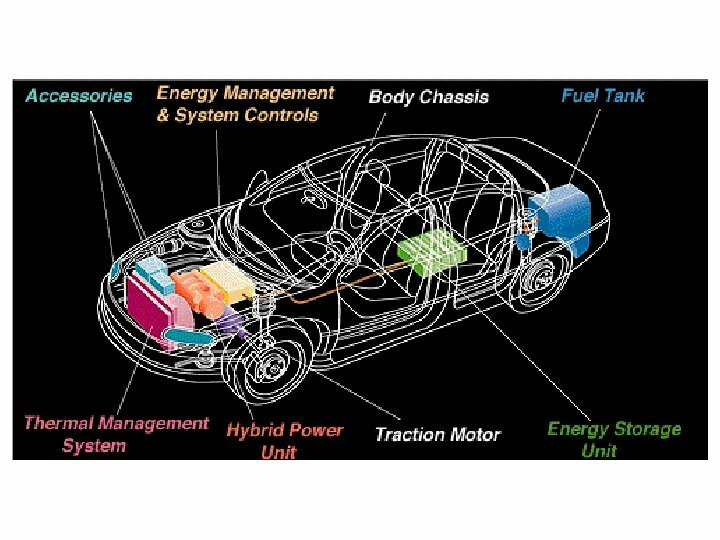 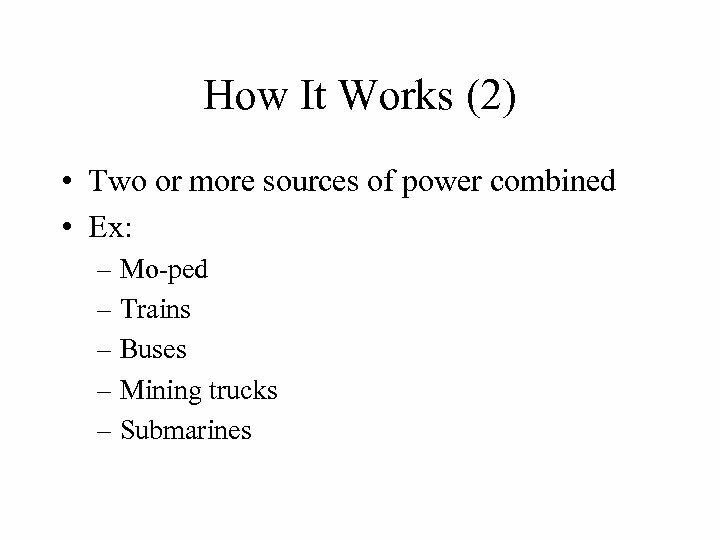 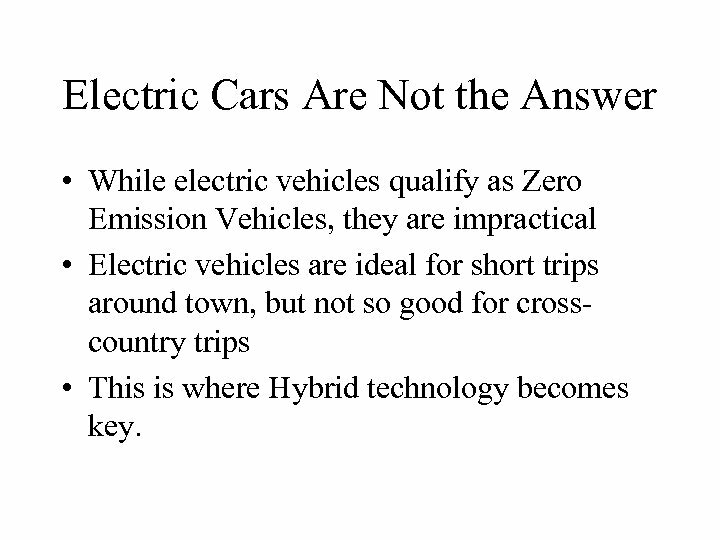 Electric Cars Are Not the Answer • While electric vehicles qualify as Zero Emission Vehicles, they are impractical • Electric vehicles are ideal for short trips around town, but not so good for crosscountry trips • This is where Hybrid technology becomes key. 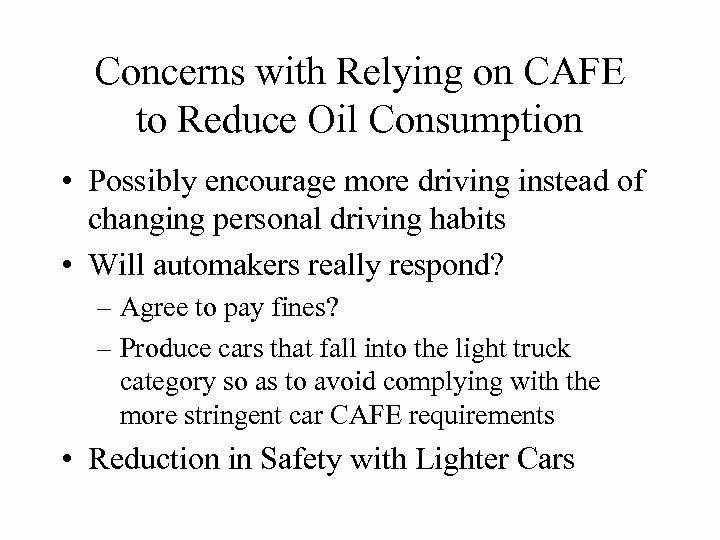 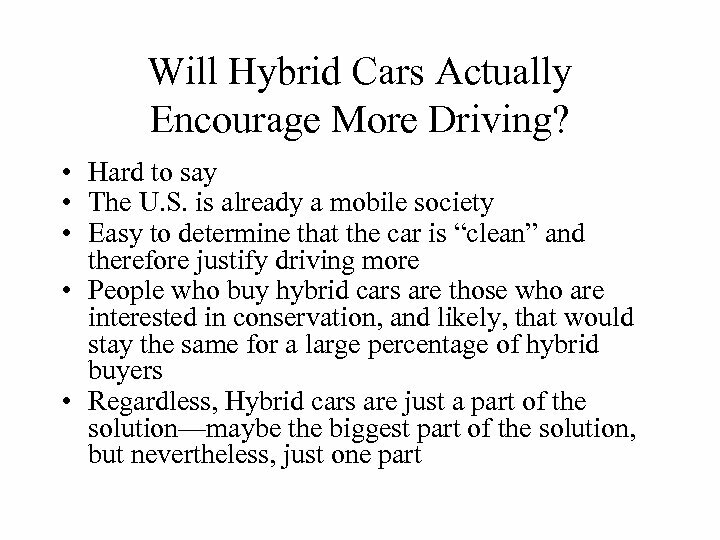 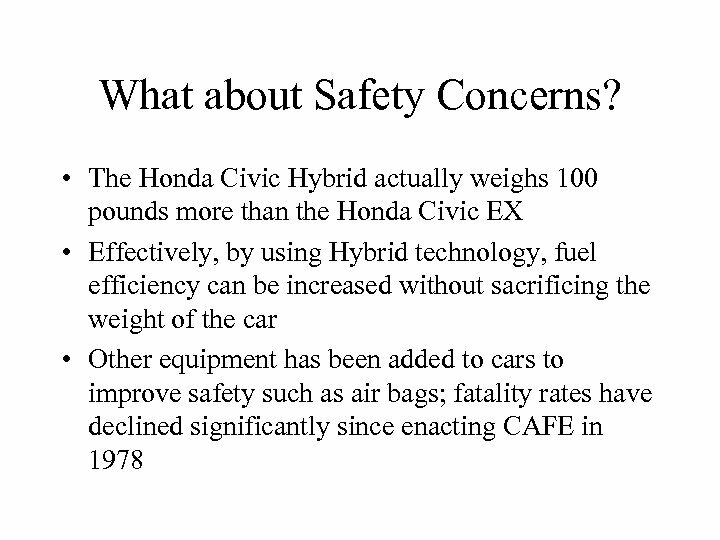 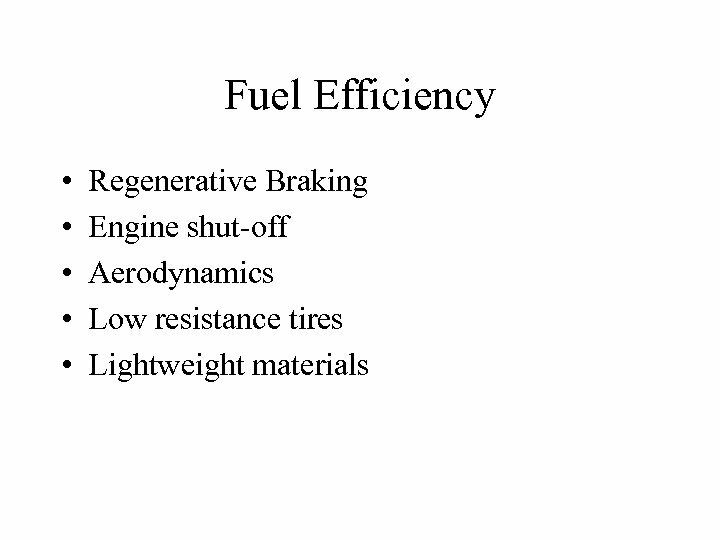 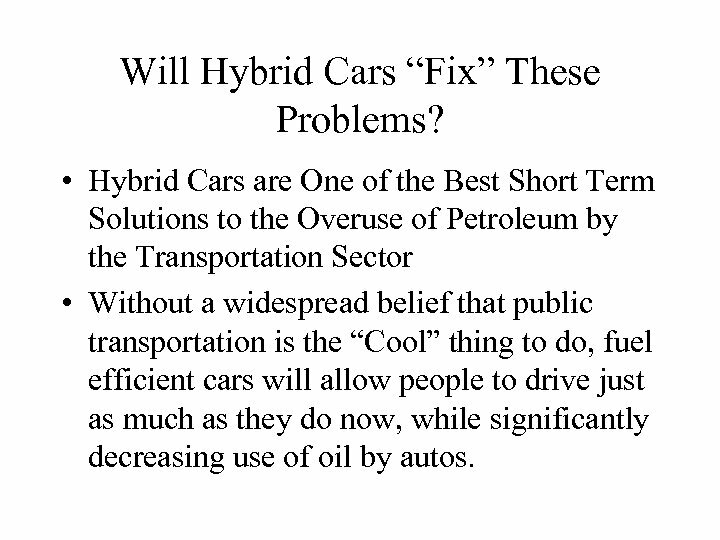 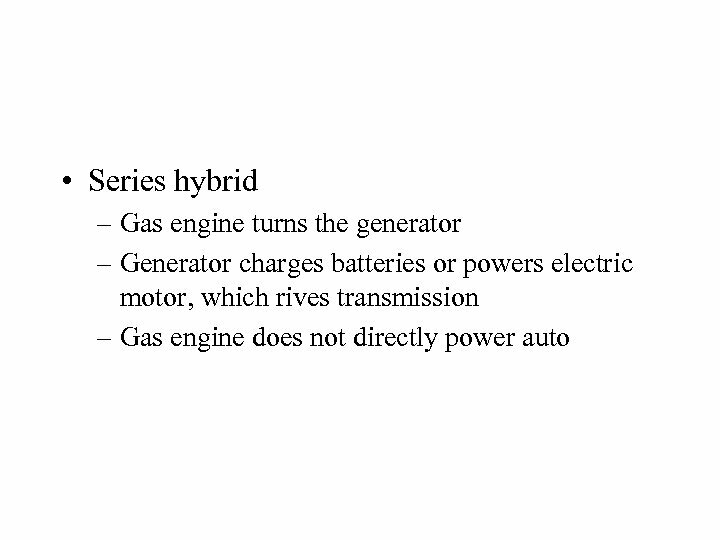 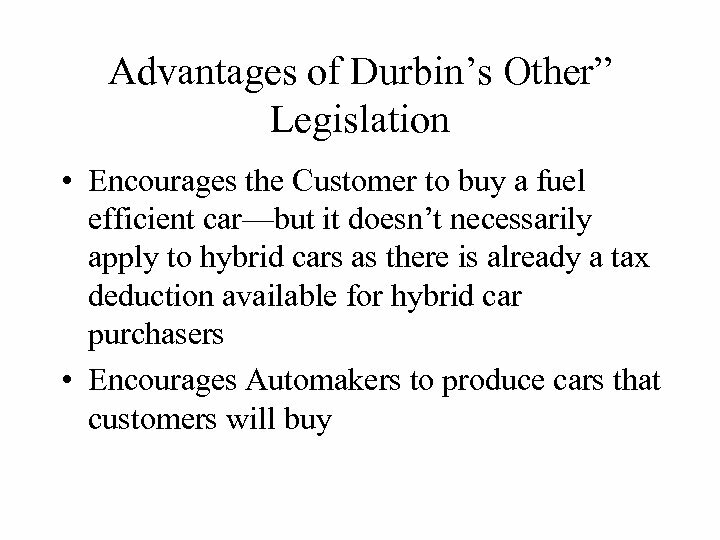 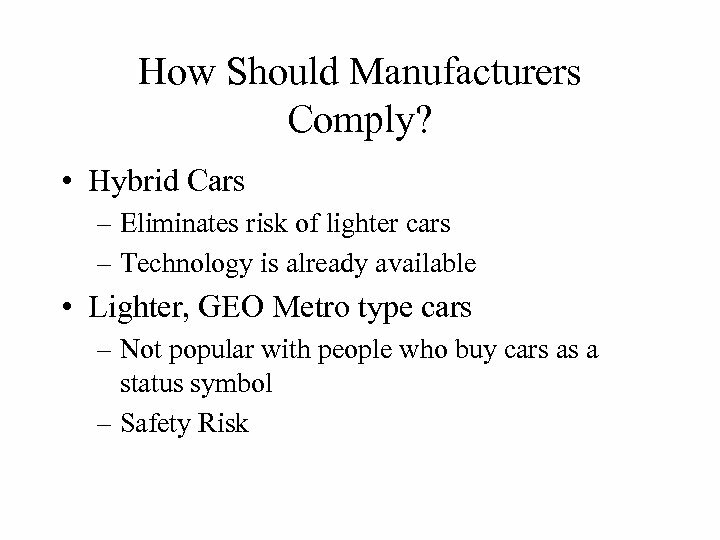 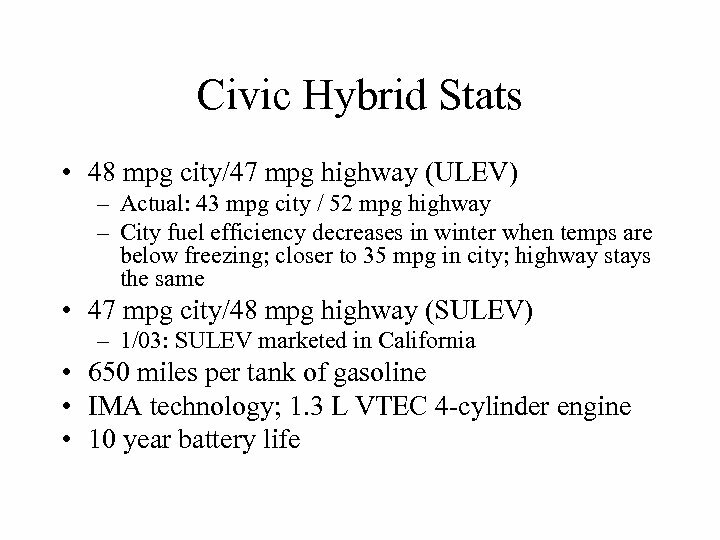 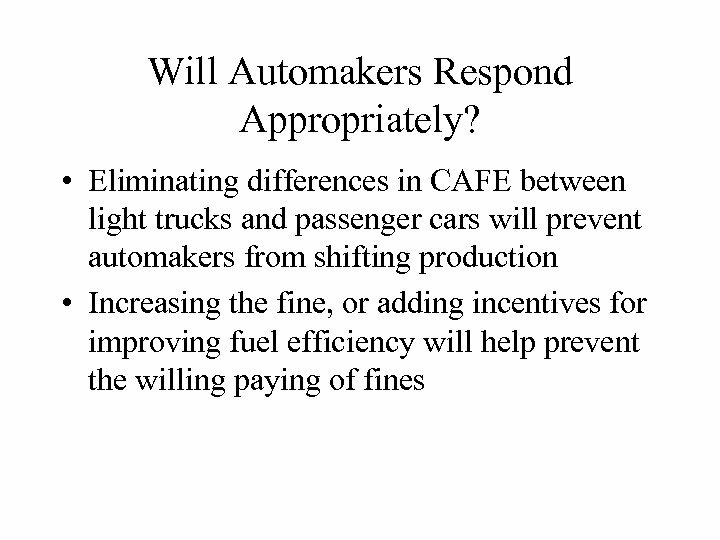 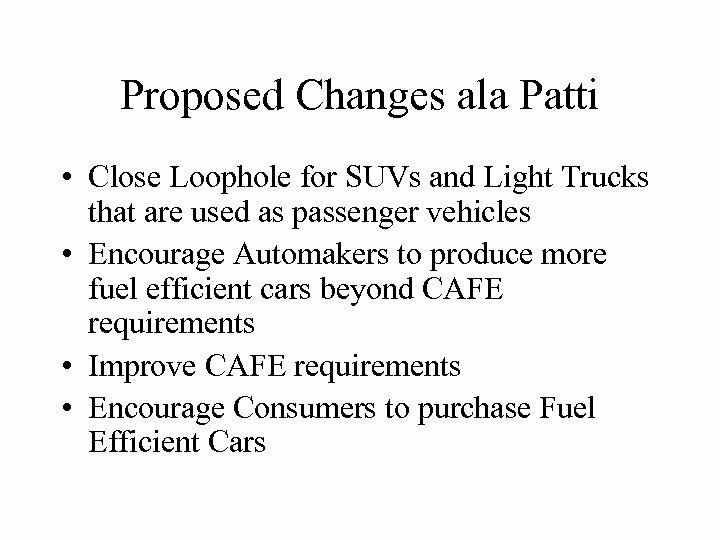 Will Hybrid Cars “Fix” These Problems? 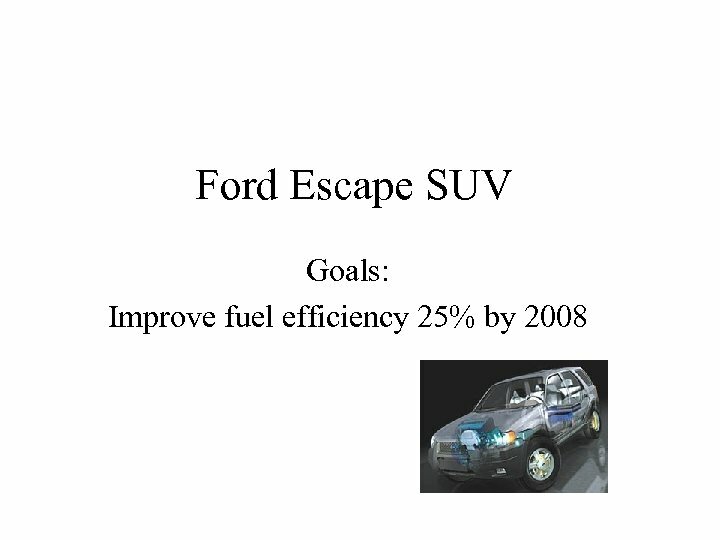 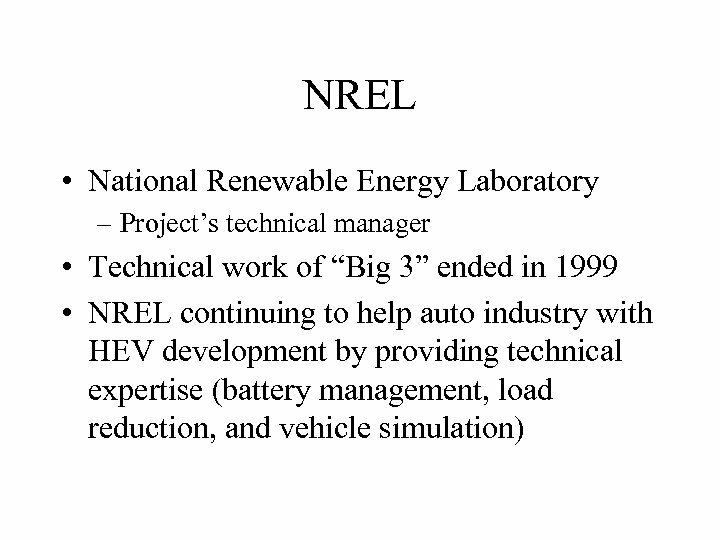 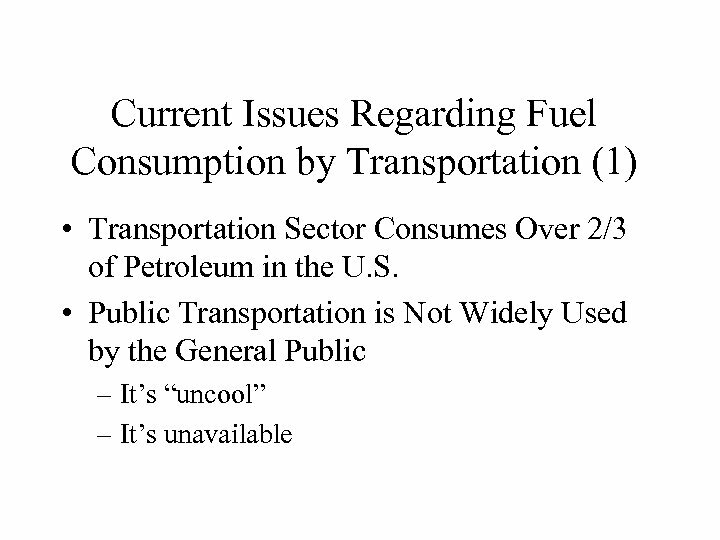 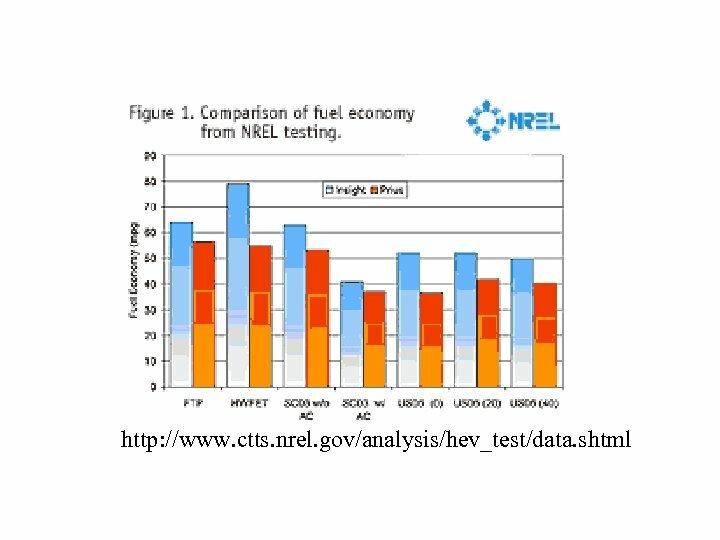 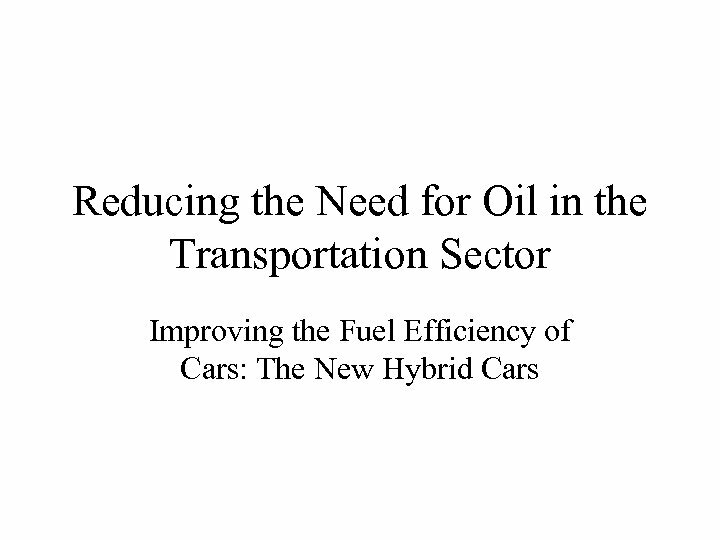 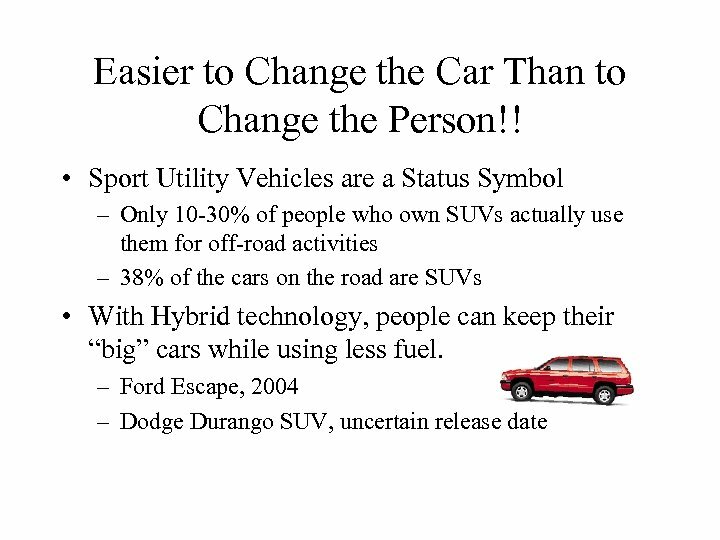 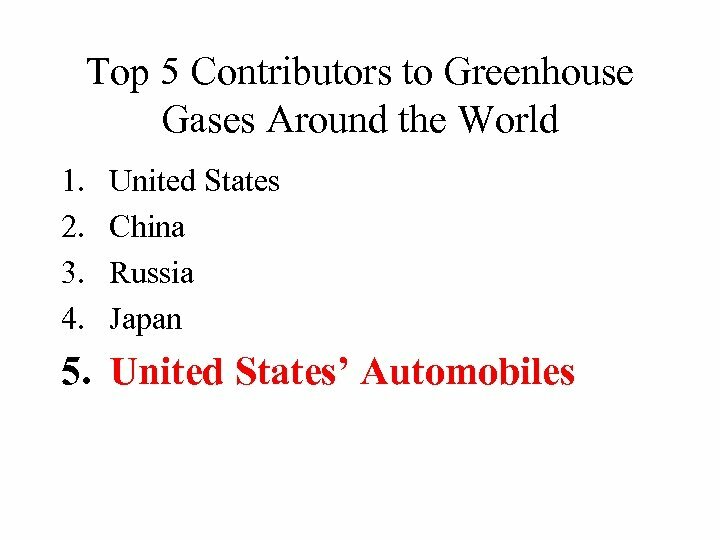 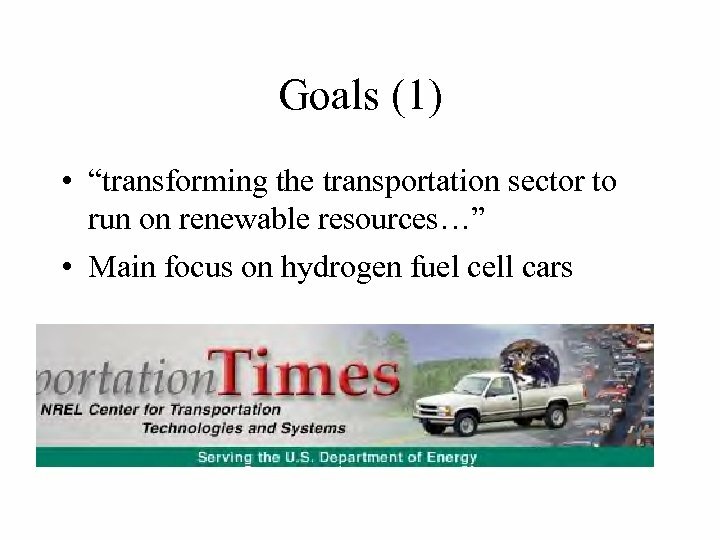 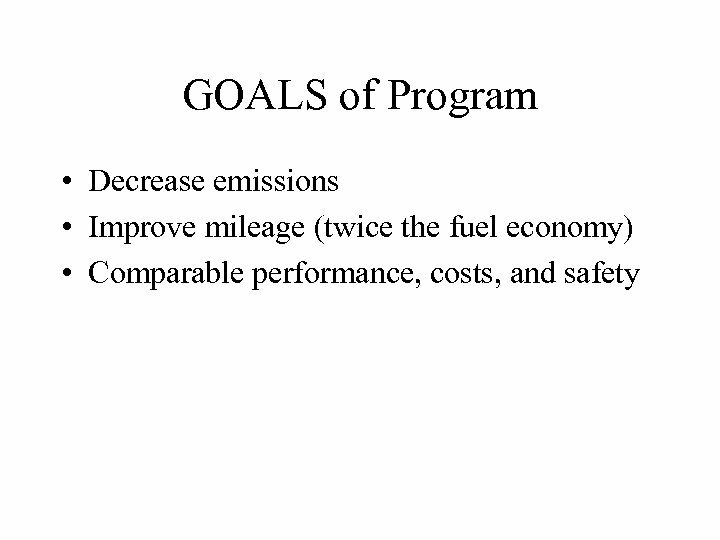 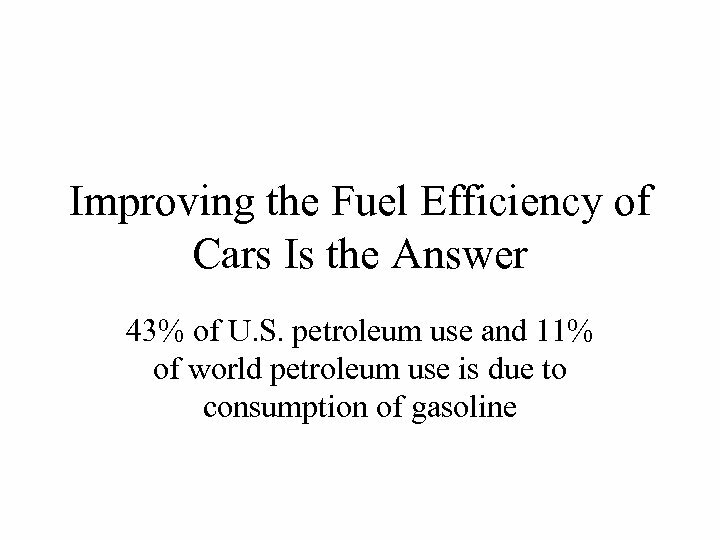 • Hybrid Cars are One of the Best Short Term Solutions to the Overuse of Petroleum by the Transportation Sector • Without a widespread belief that public transportation is the “Cool” thing to do, fuel efficient cars will allow people to drive just as much as they do now, while significantly decreasing use of oil by autos. 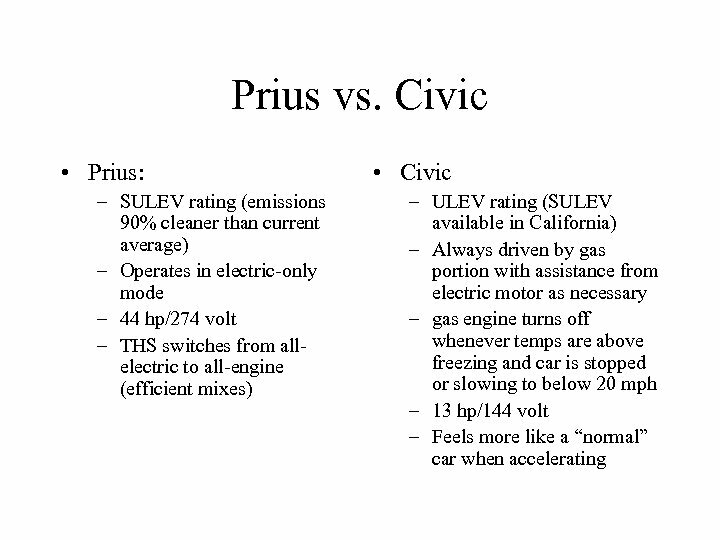 Are the Differences Enough to Re. 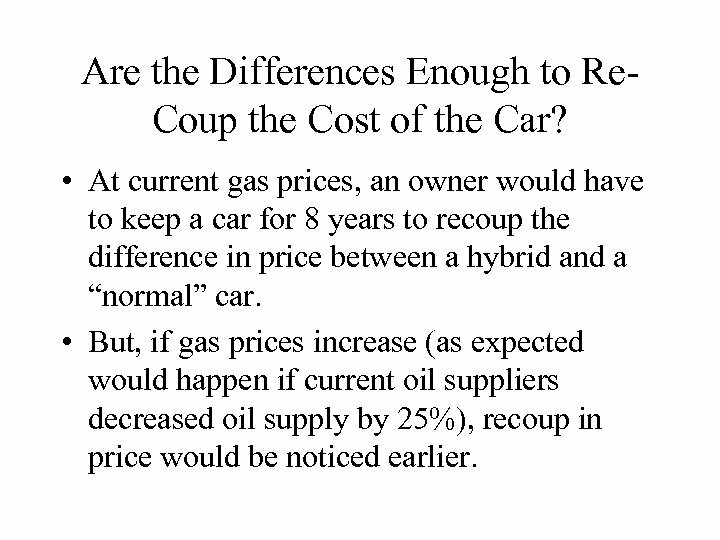 Coup the Cost of the Car? 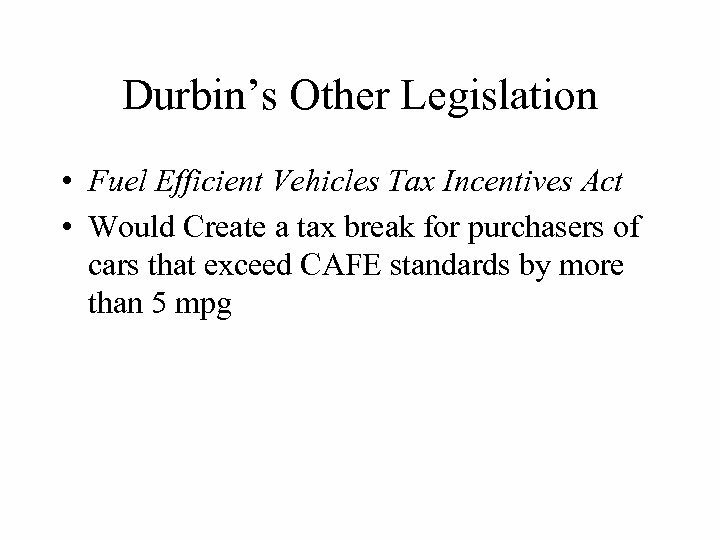 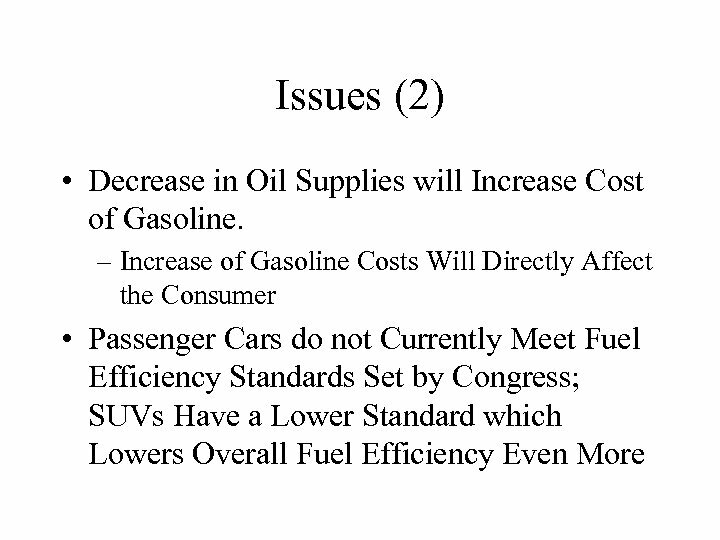 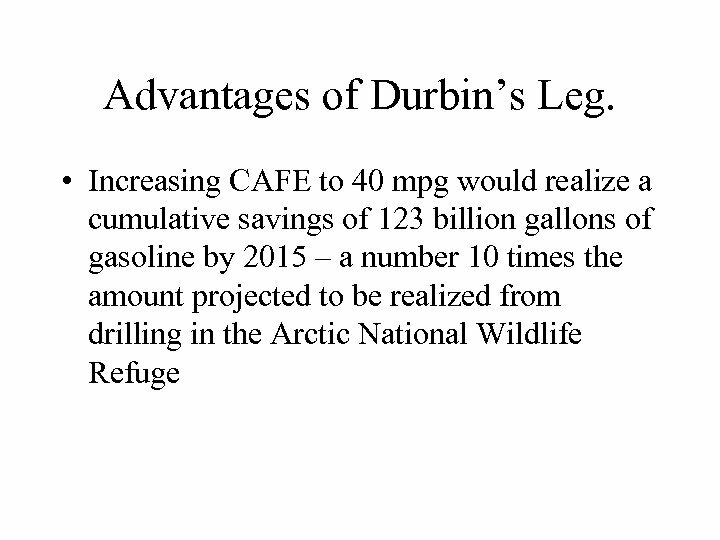 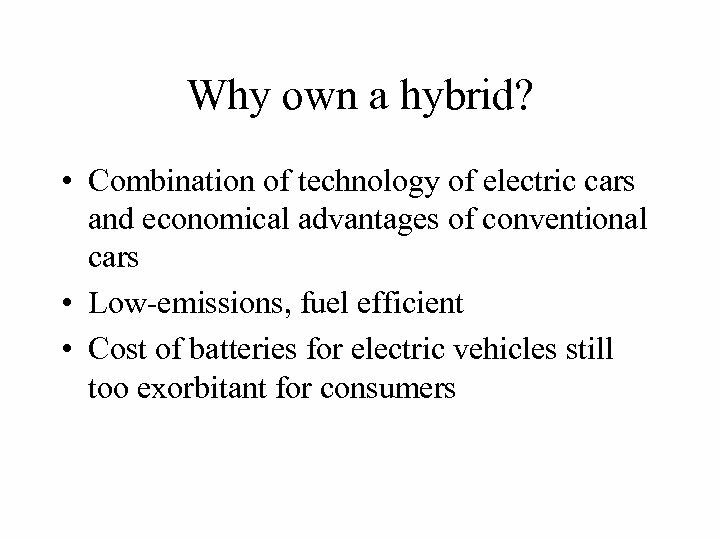 • At current gas prices, an owner would have to keep a car for 8 years to recoup the difference in price between a hybrid and a “normal” car. 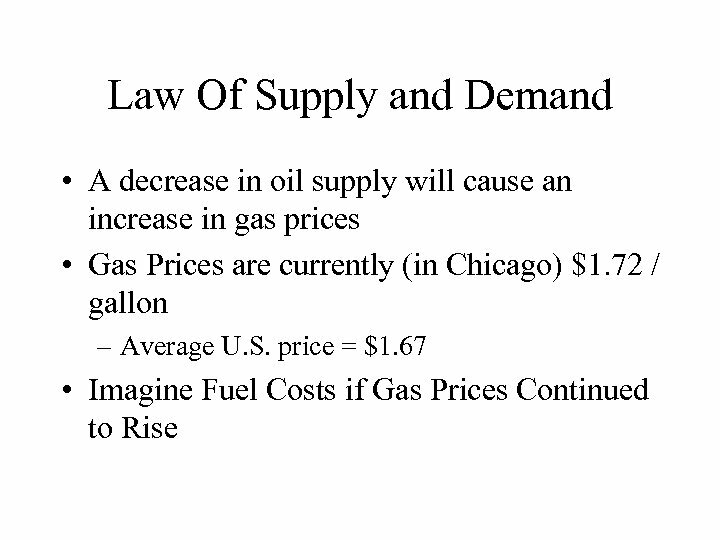 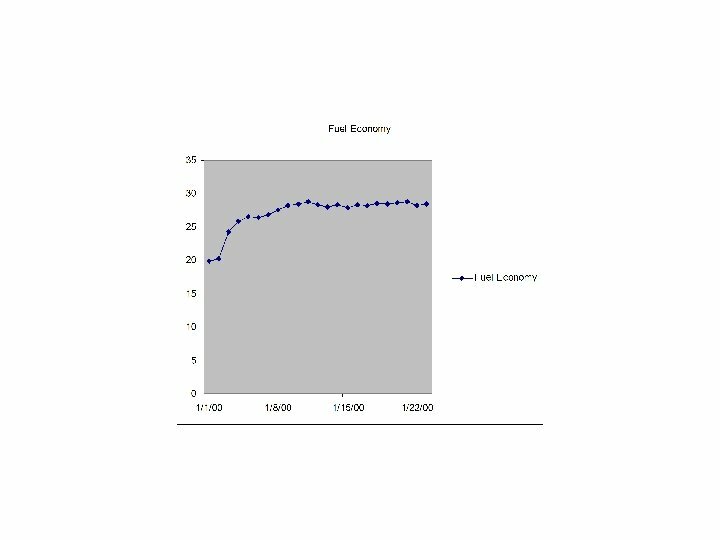 • But, if gas prices increase (as expected would happen if current oil suppliers decreased oil supply by 25%), recoup in price would be noticed earlier. 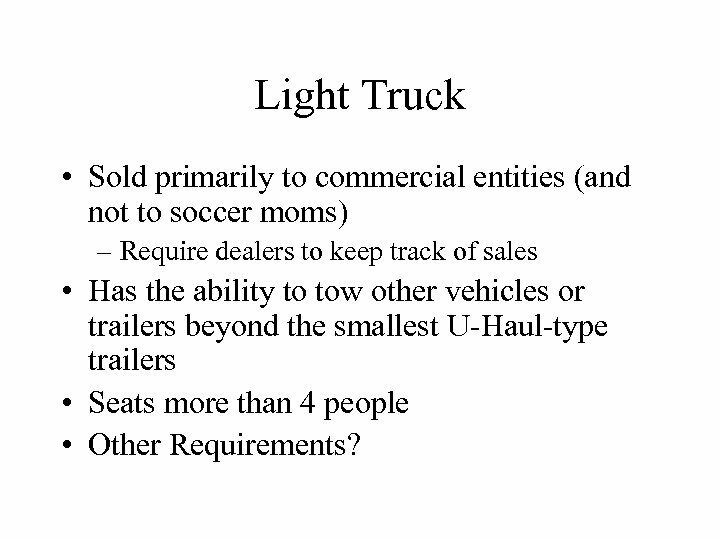 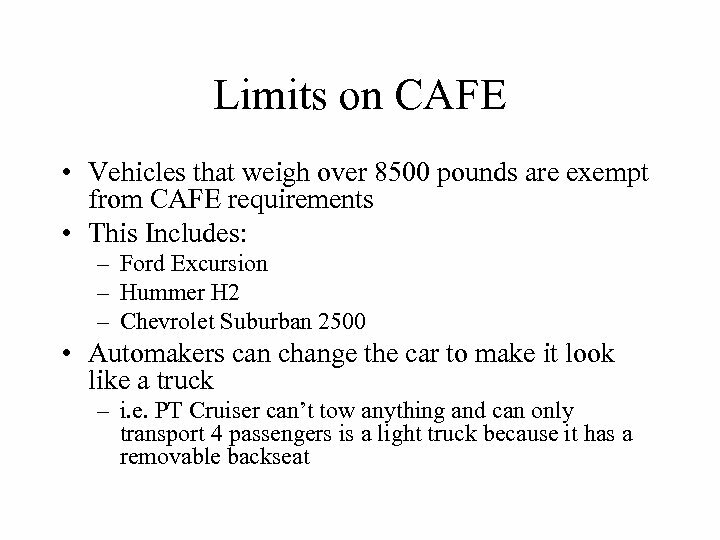 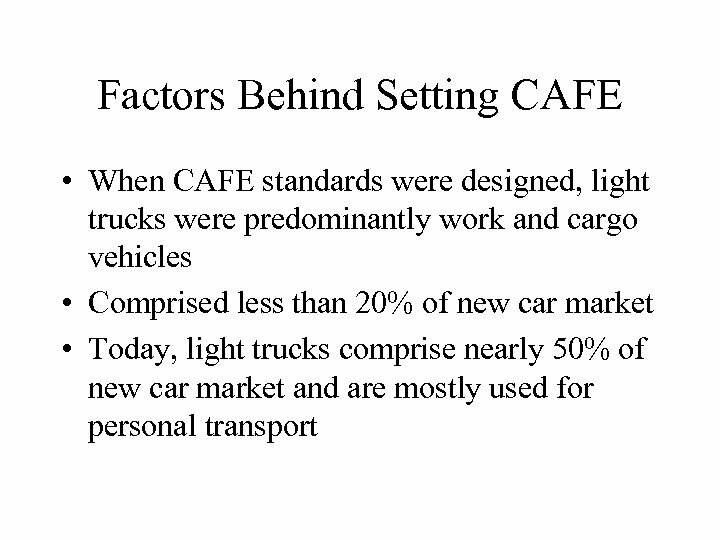 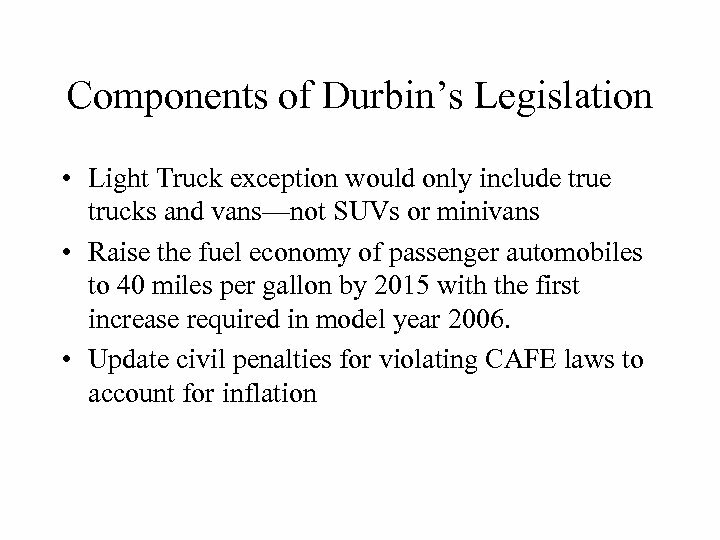 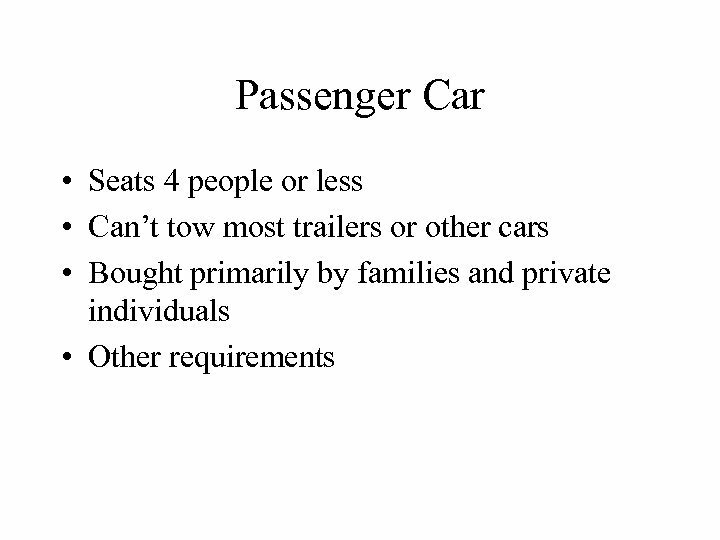 Light Truck • Sold primarily to commercial entities (and not to soccer moms) – Require dealers to keep track of sales • Has the ability to tow other vehicles or trailers beyond the smallest U-Haul-type trailers • Seats more than 4 people • Other Requirements? 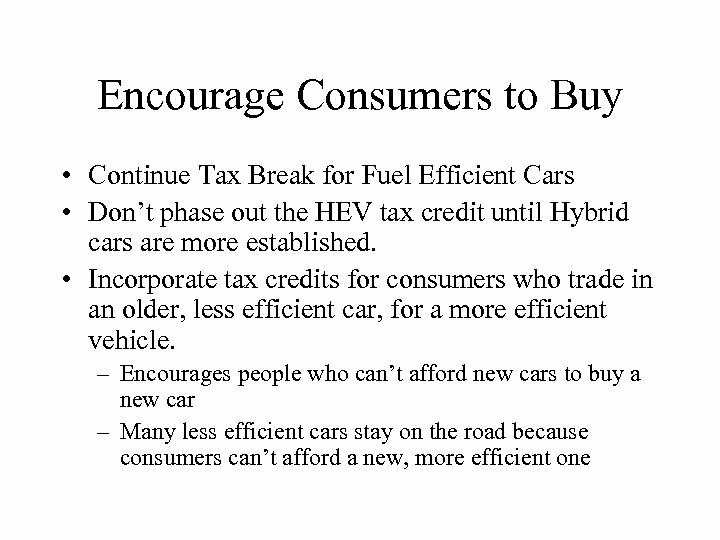 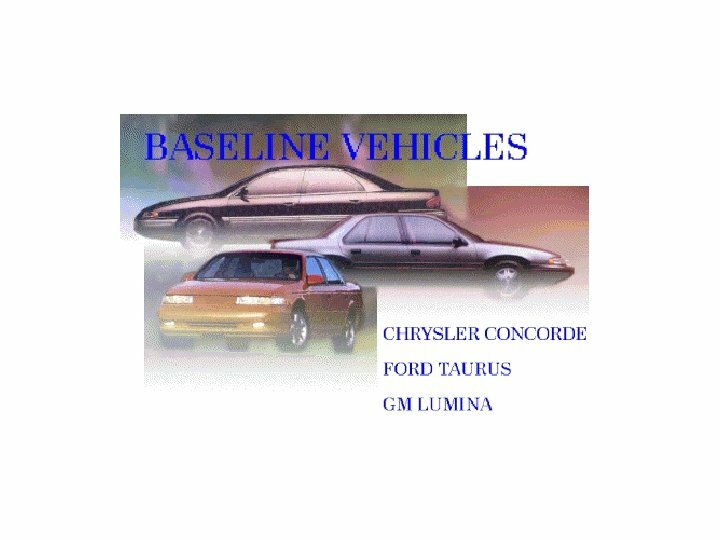 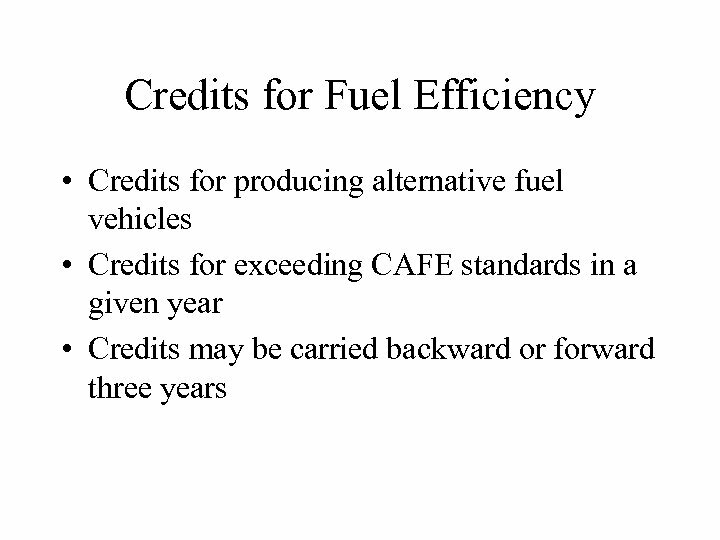 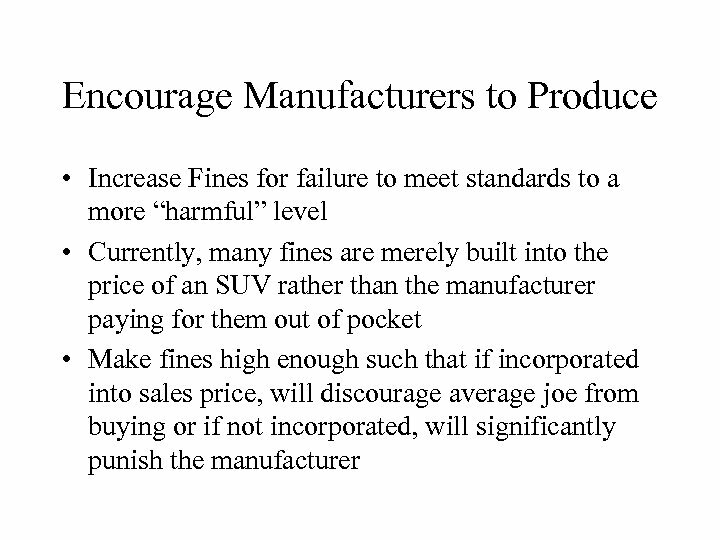 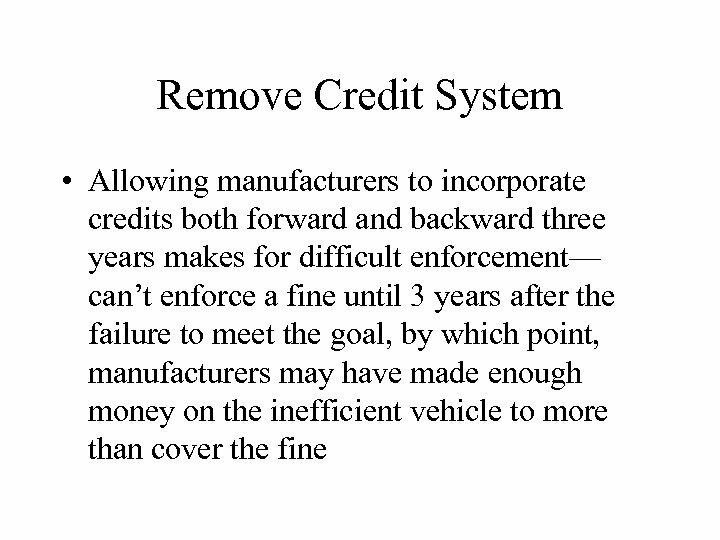 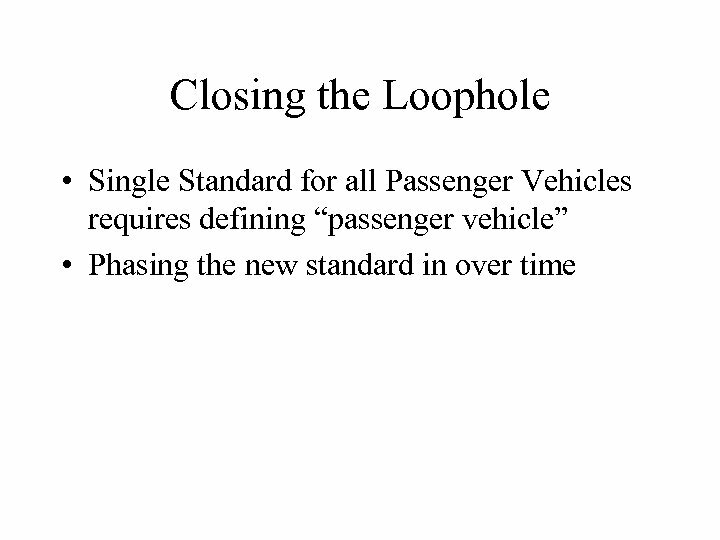 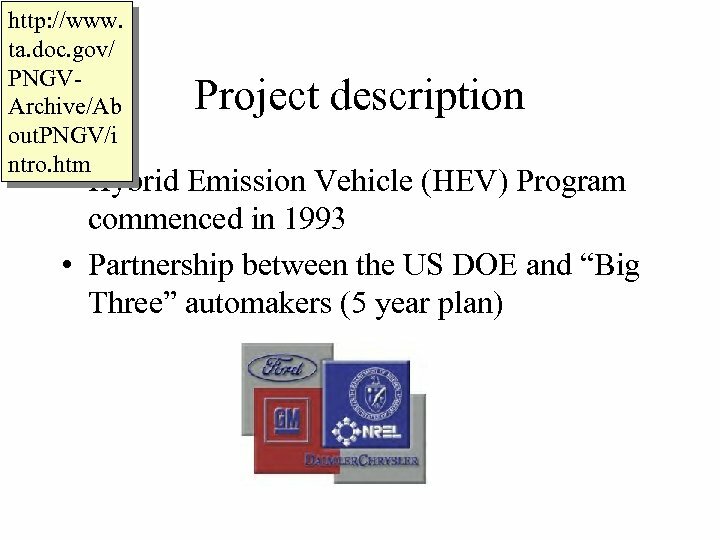 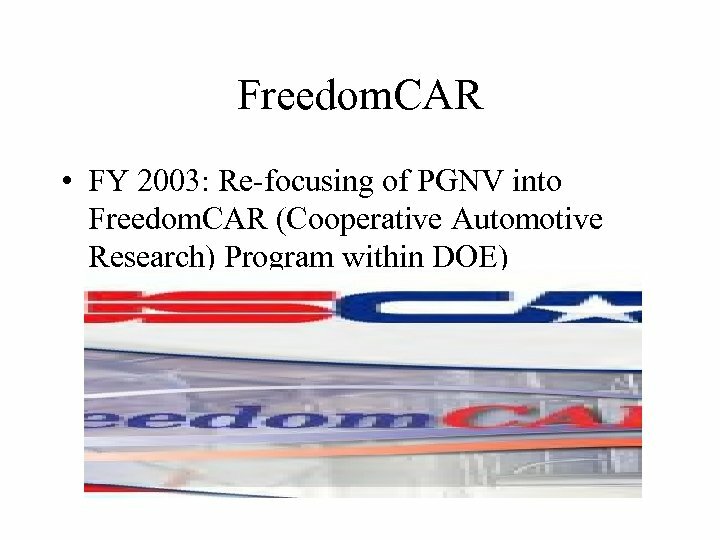 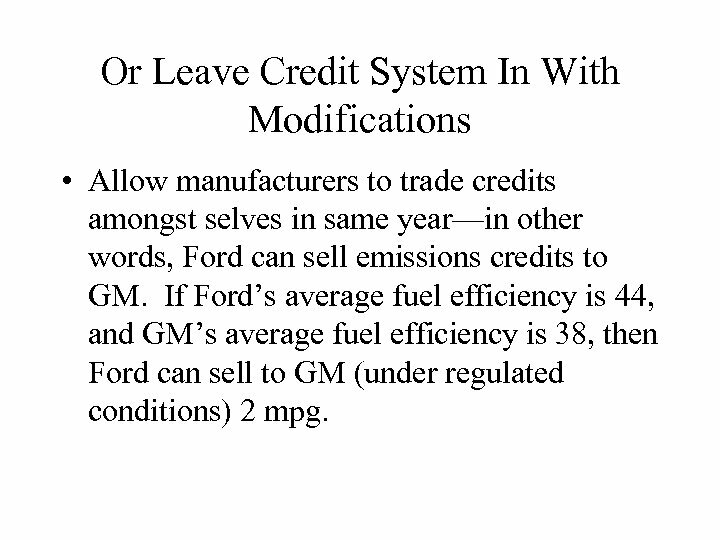 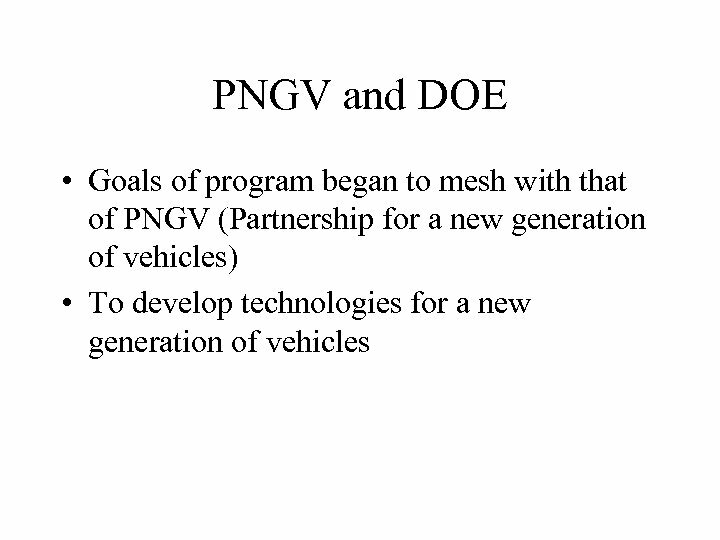 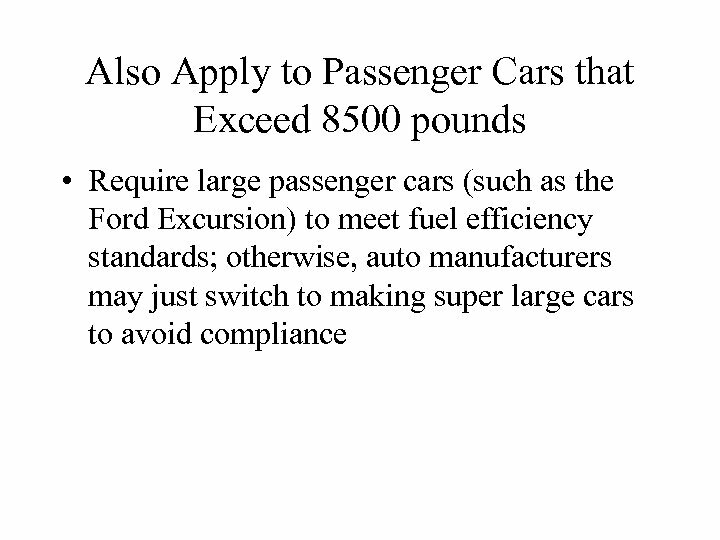 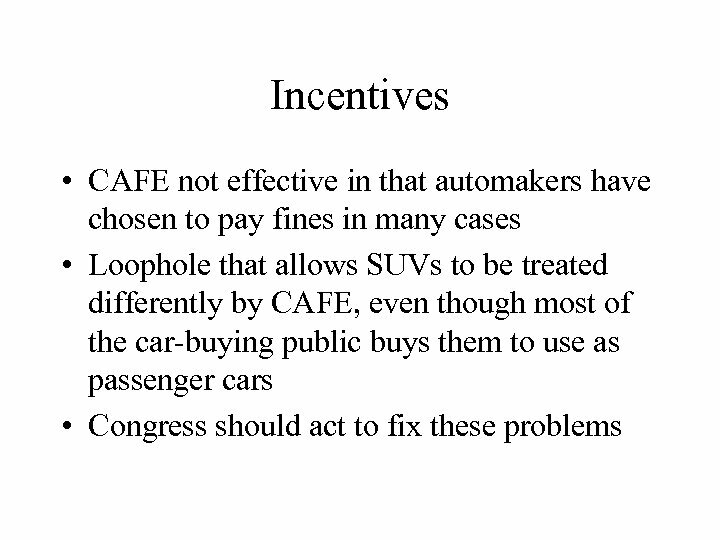 Or Leave Credit System In With Modifications • Allow manufacturers to trade credits amongst selves in same year—in other words, Ford can sell emissions credits to GM. 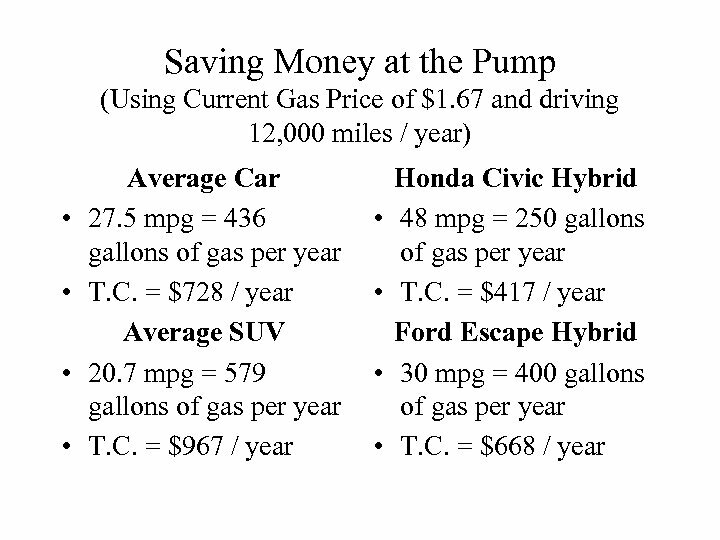 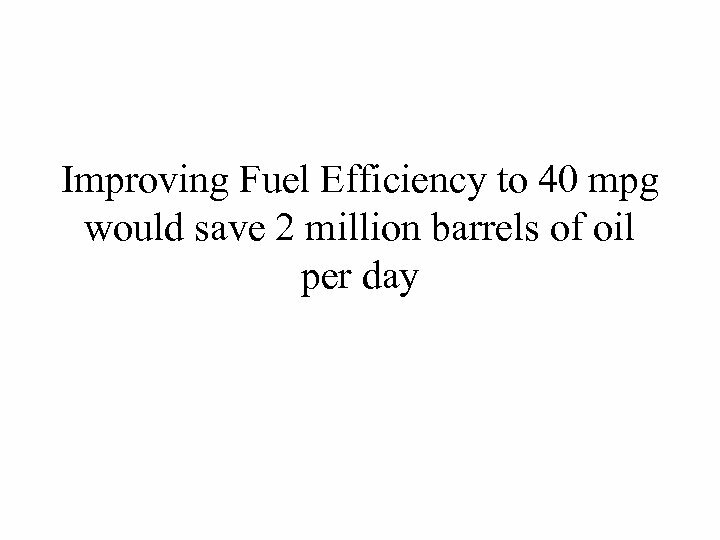 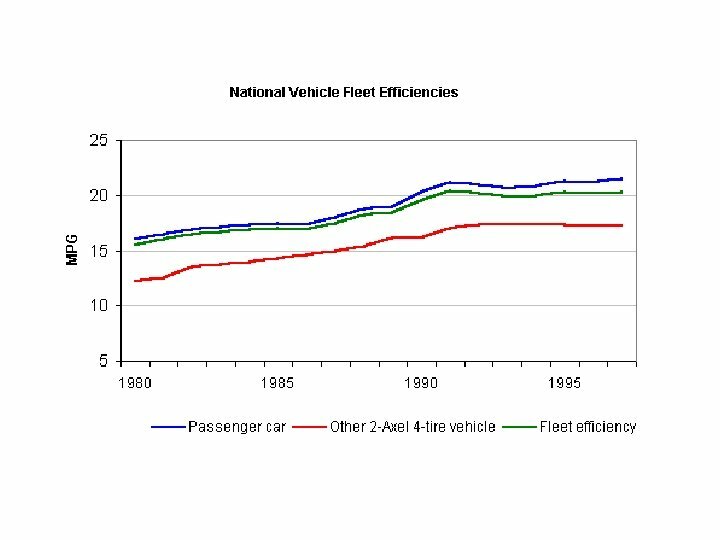 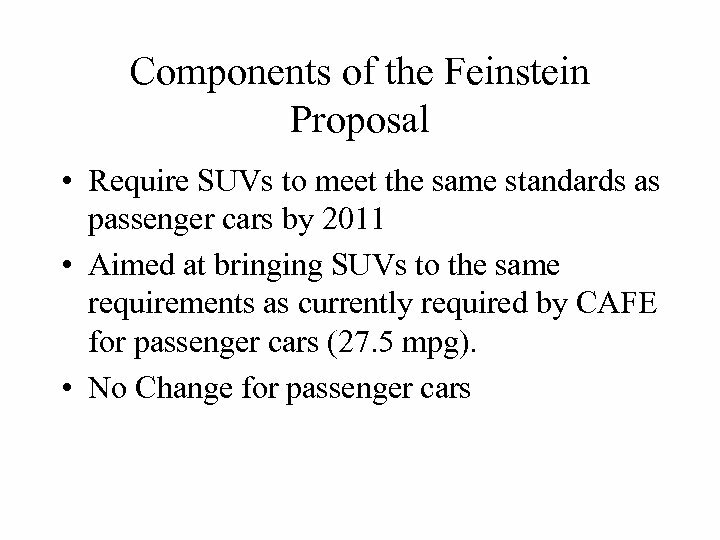 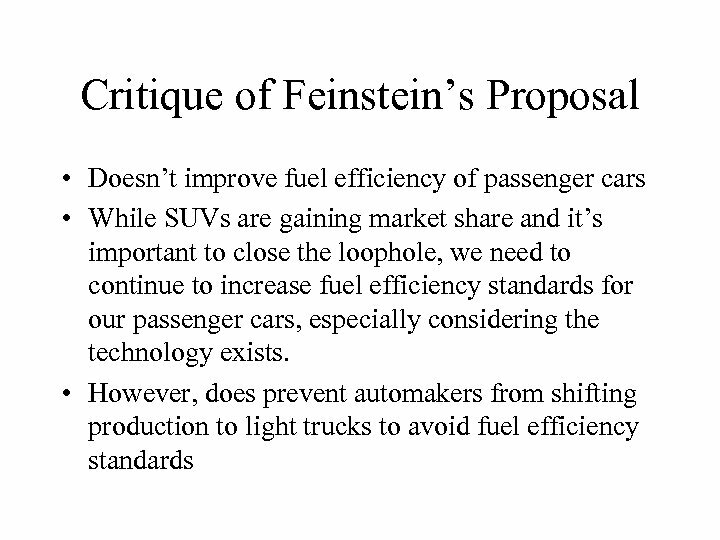 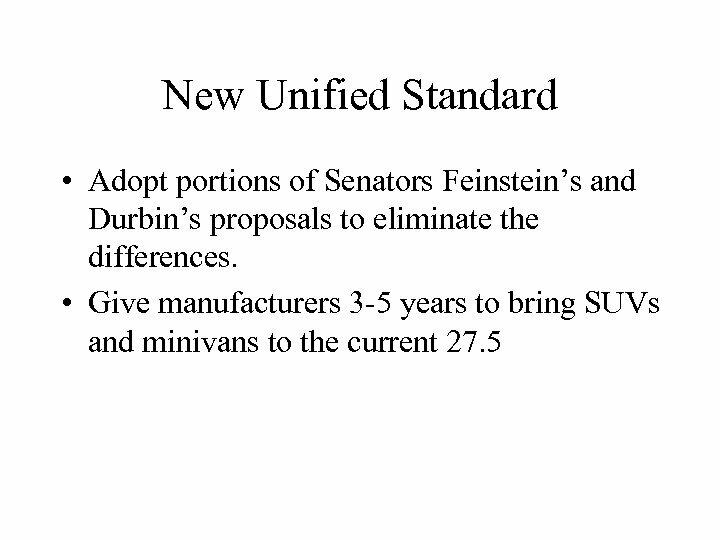 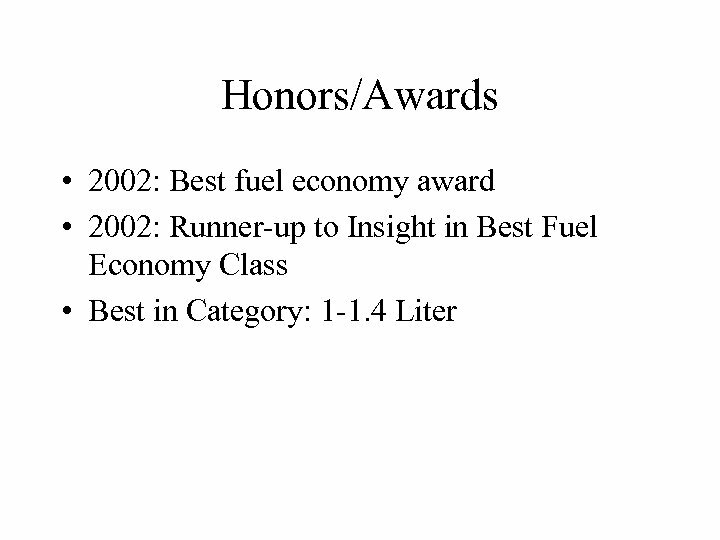 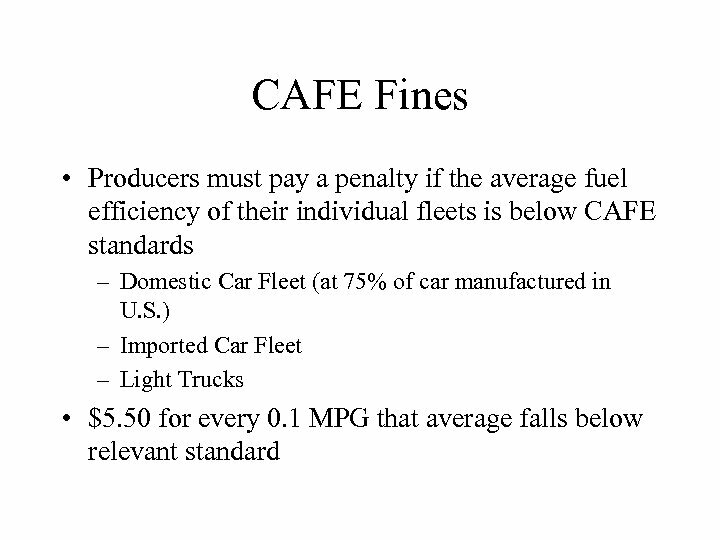 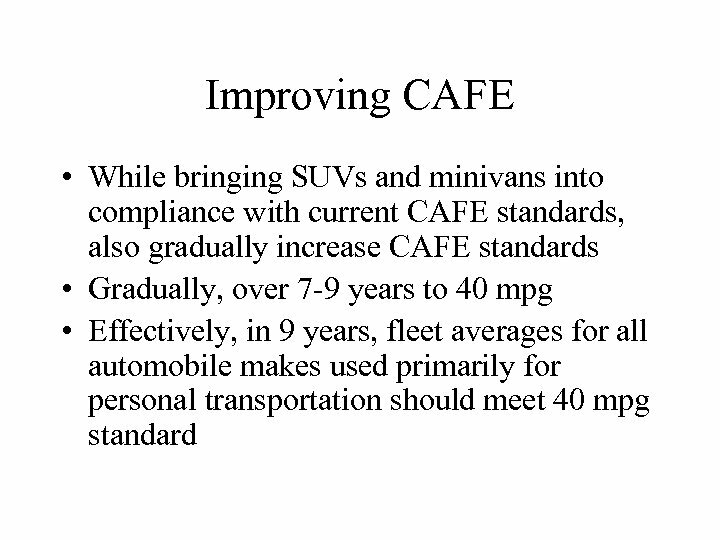 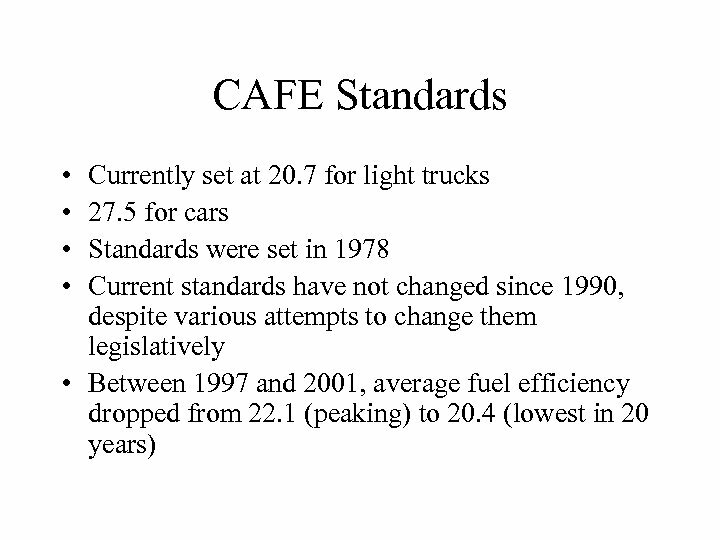 If Ford’s average fuel efficiency is 44, and GM’s average fuel efficiency is 38, then Ford can sell to GM (under regulated conditions) 2 mpg. 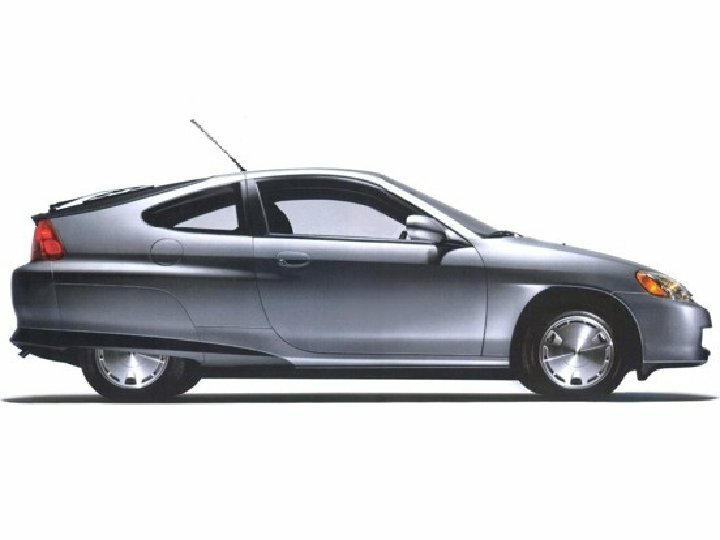 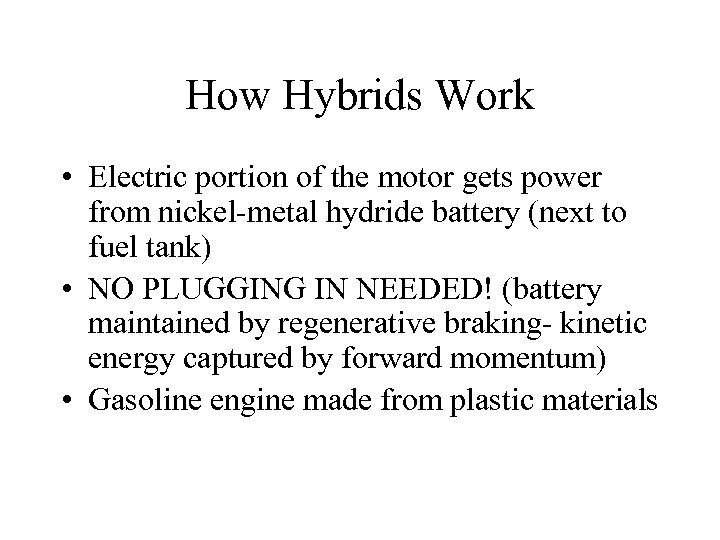 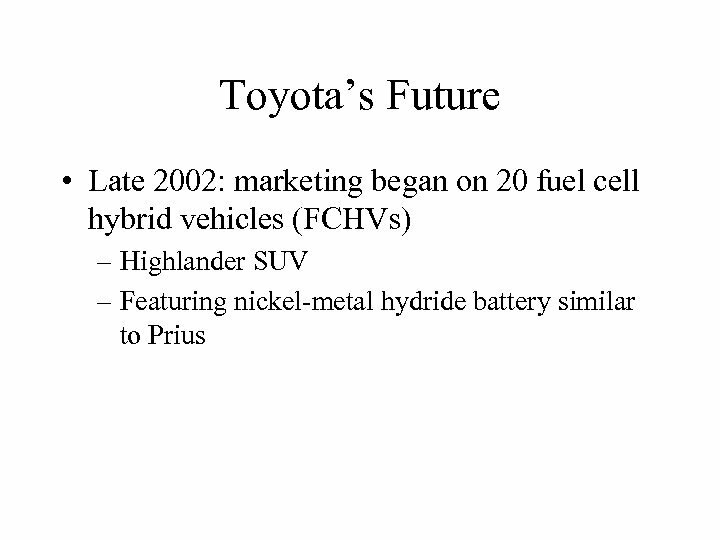 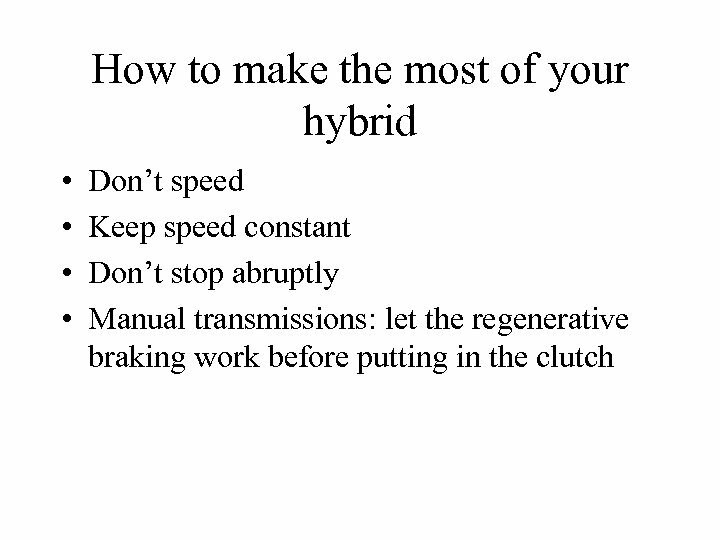 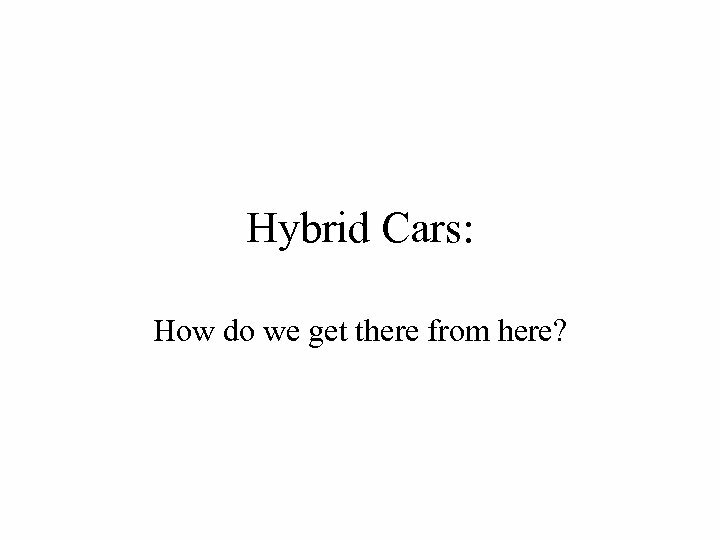 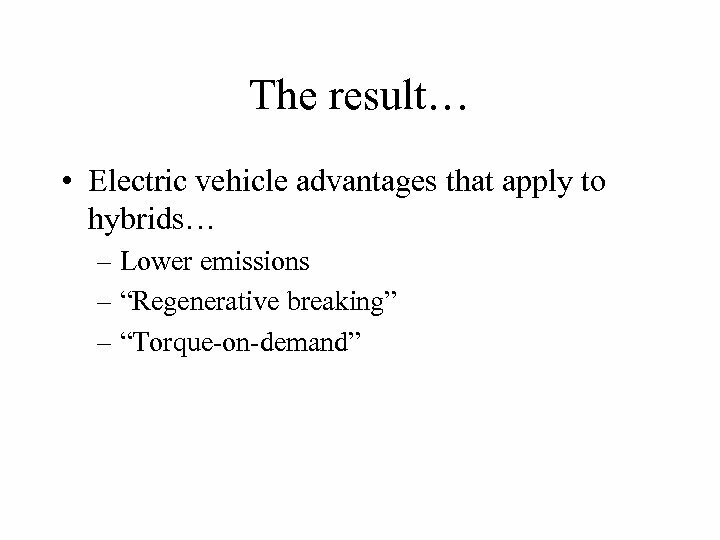 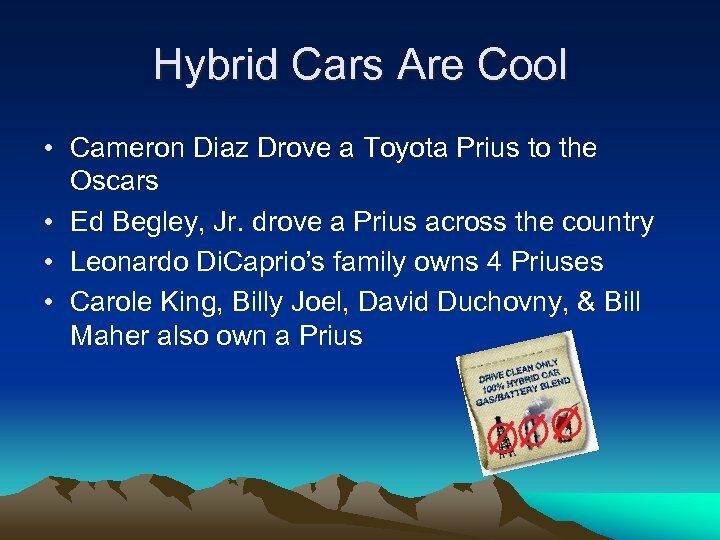 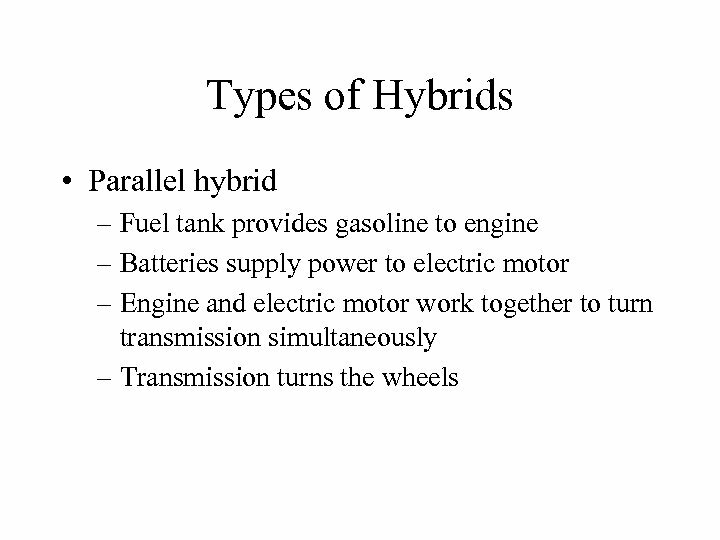 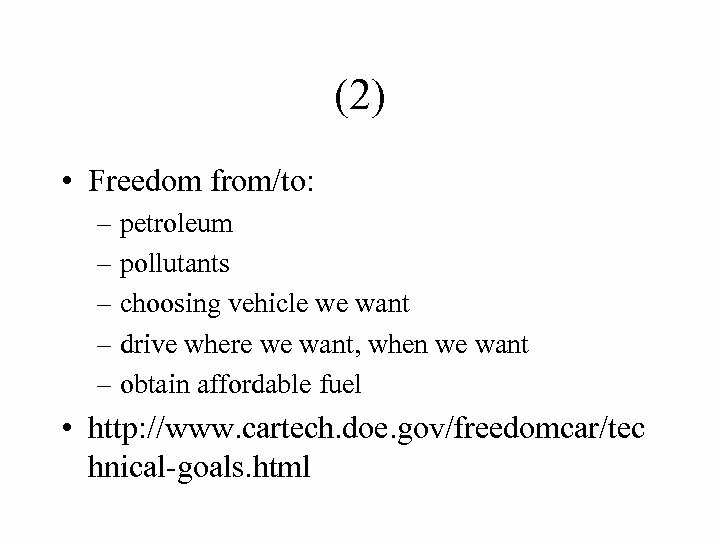 Hybrid Cars: How do we get there from here? 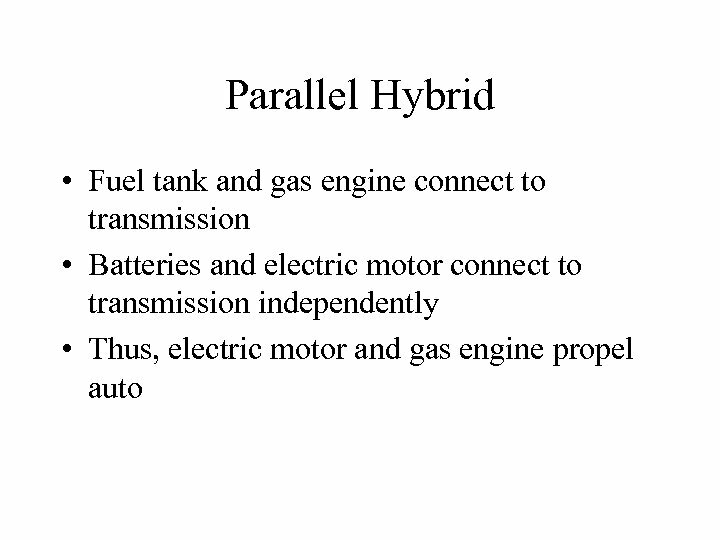 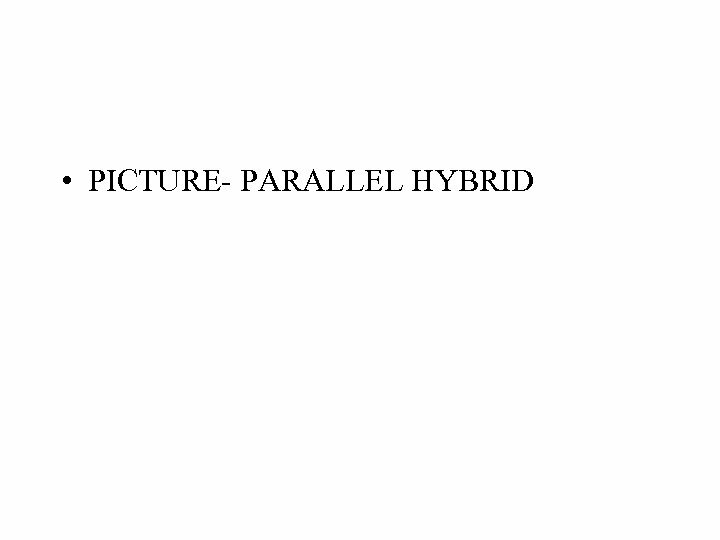 The upper arrangement is called a parallel arrangement. 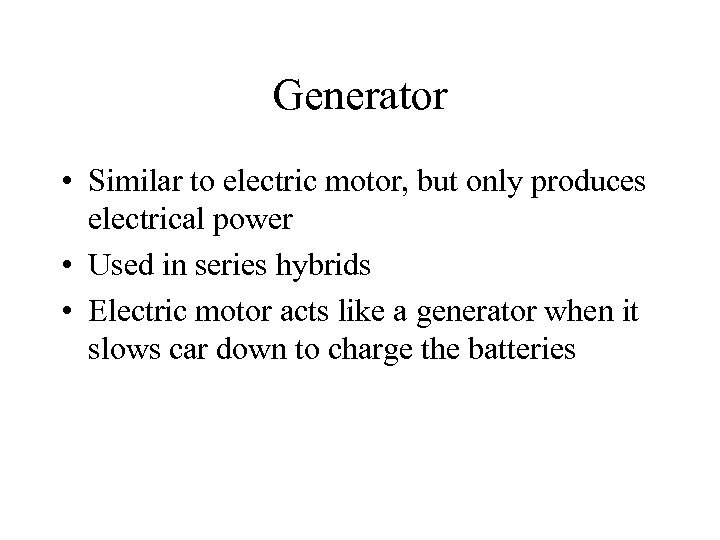 If you assume that each cell produces 1. 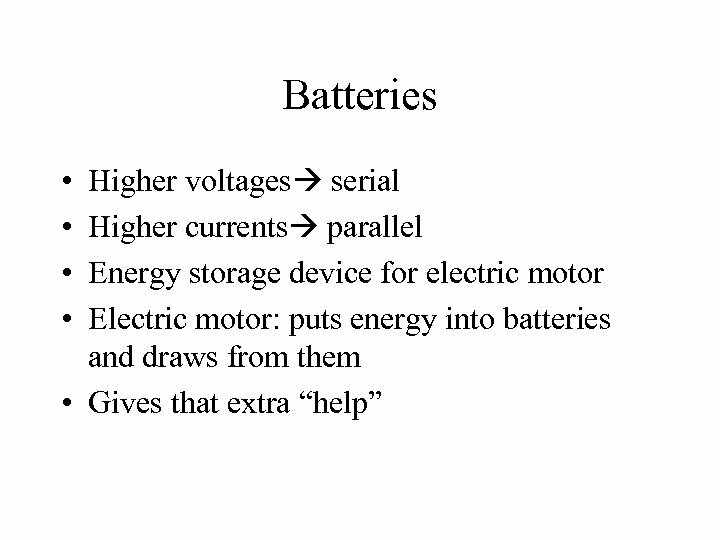 5 volts, then four batteries in parallel will also produce 1. 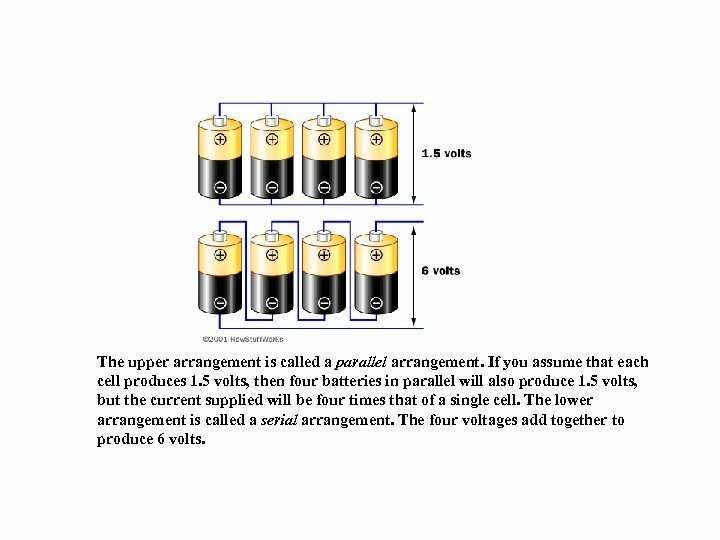 5 volts, but the current supplied will be four times that of a single cell. 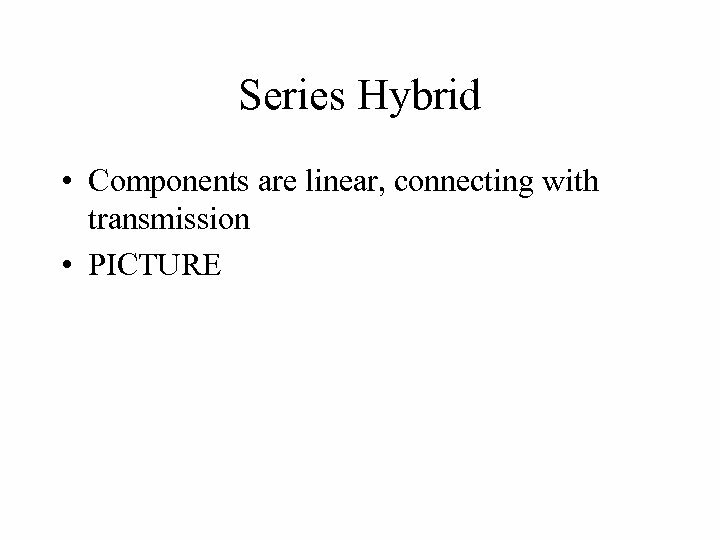 The lower arrangement is called a serial arrangement. 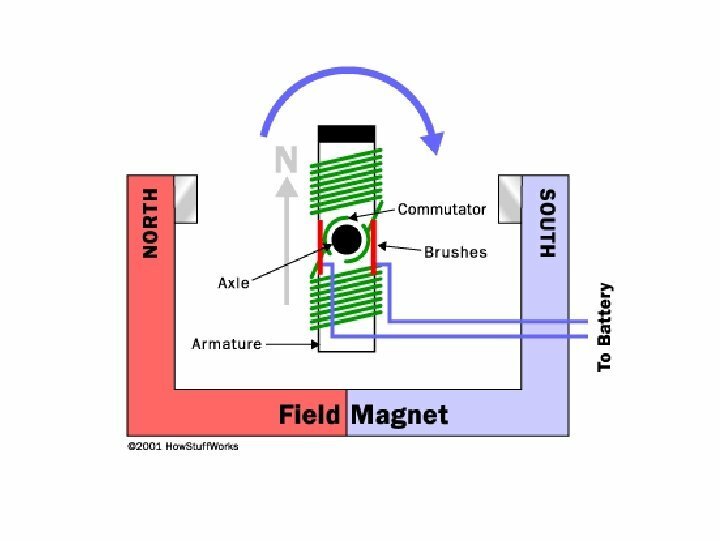 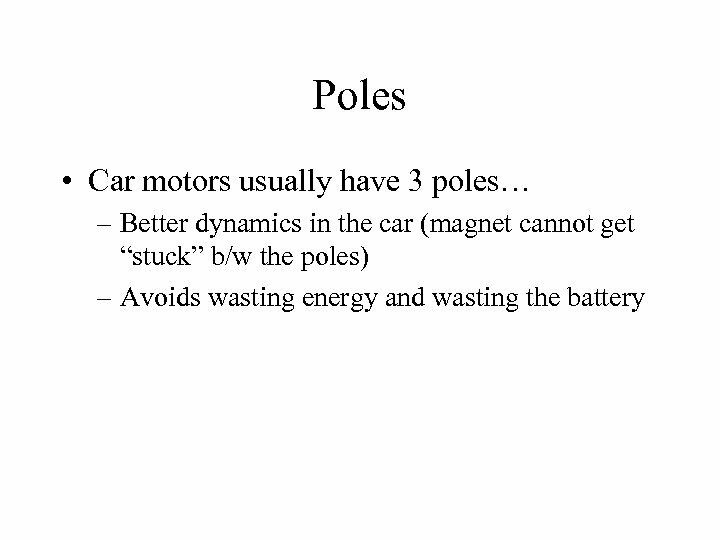 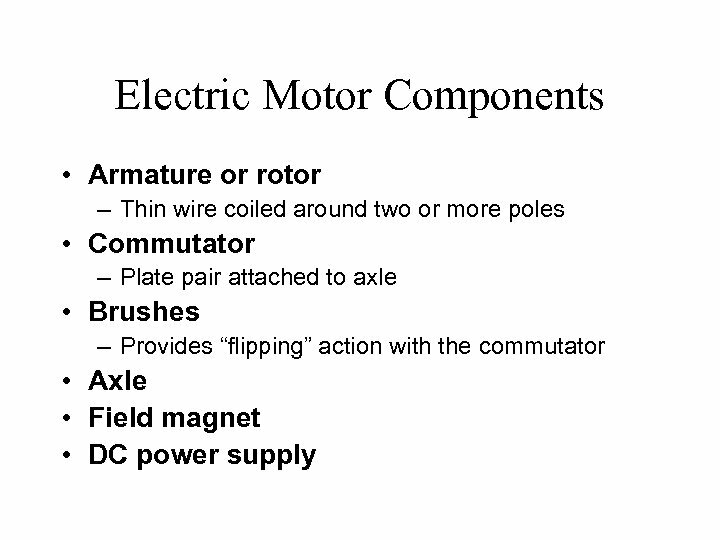 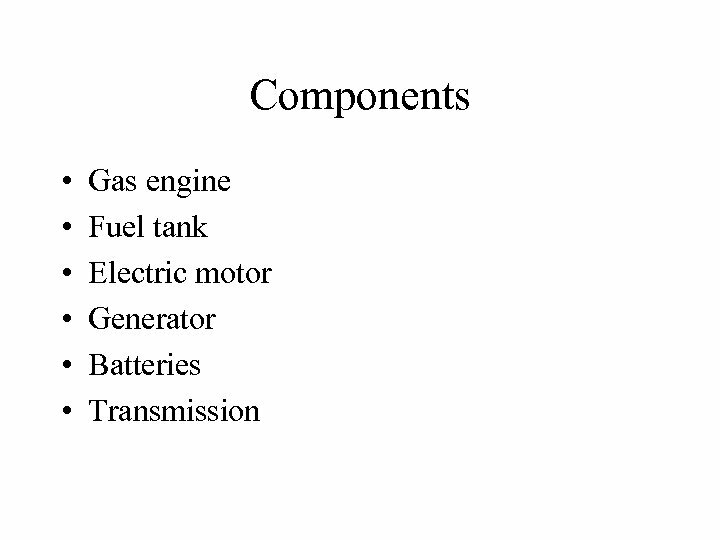 The four voltages add together to produce 6 volts. 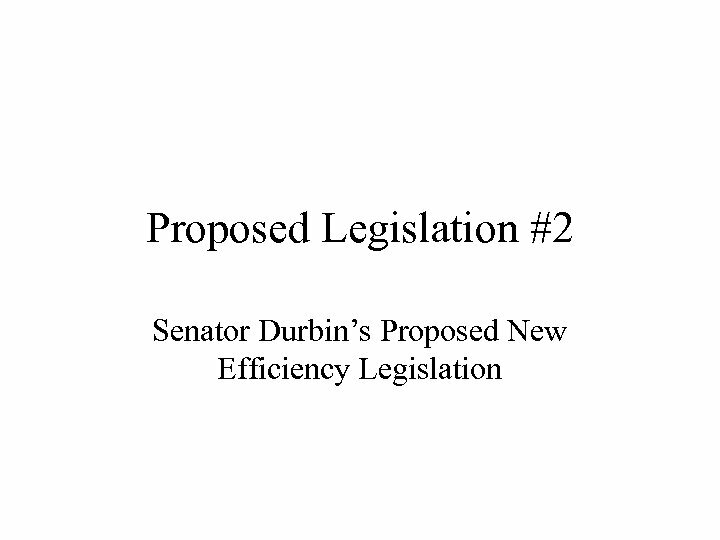 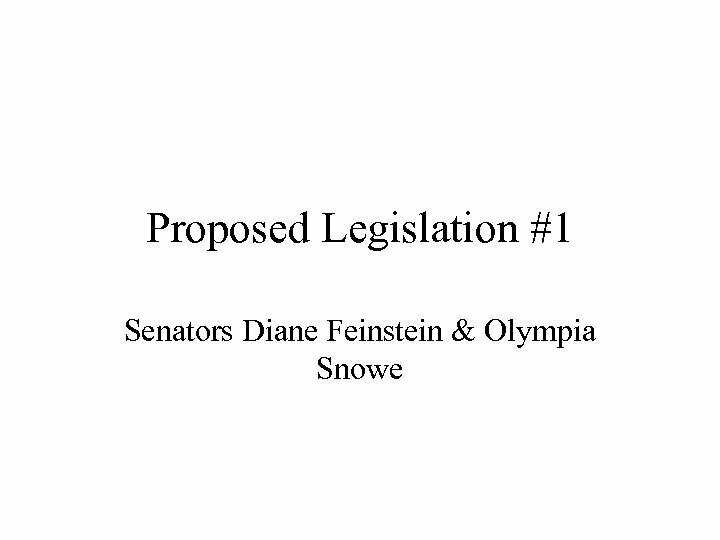 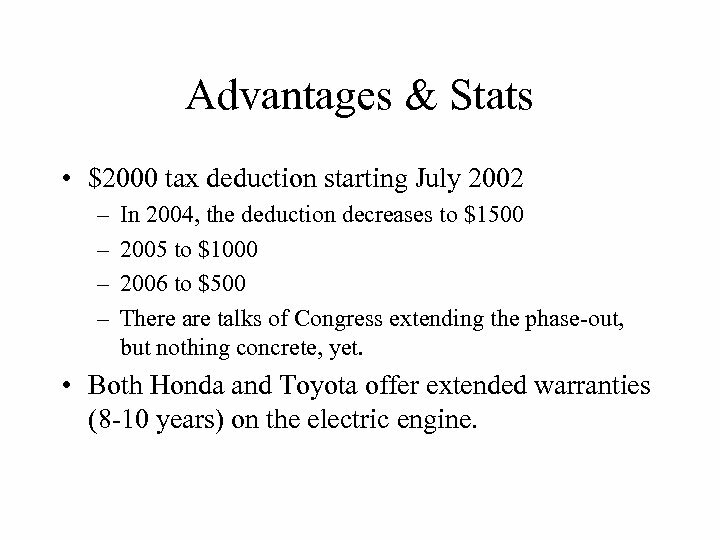 Advantages & Stats • $2000 tax deduction starting July 2002 – – In 2004, the deduction decreases to $1500 2005 to $1000 2006 to $500 There are talks of Congress extending the phase-out, but nothing concrete, yet. 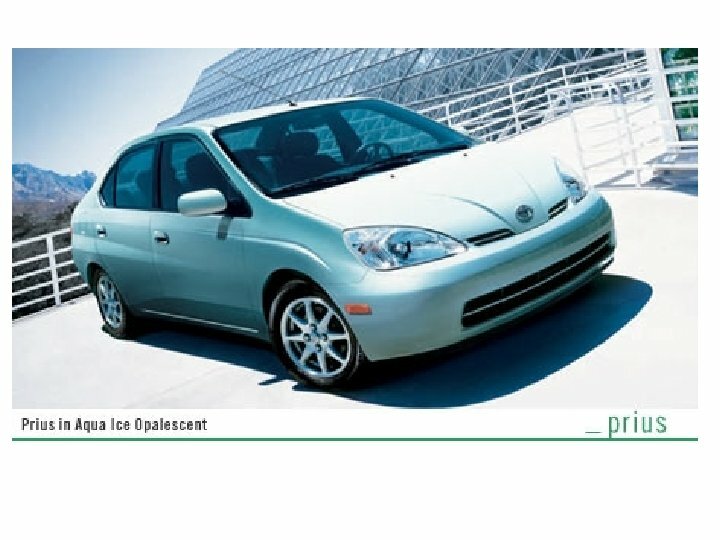 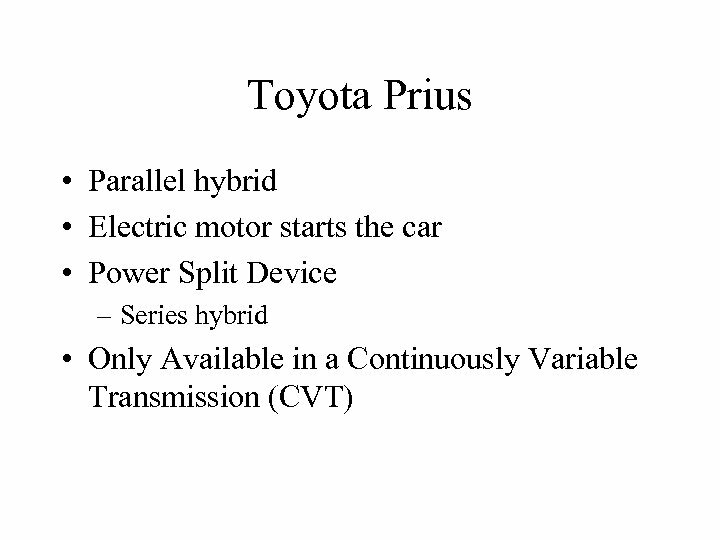 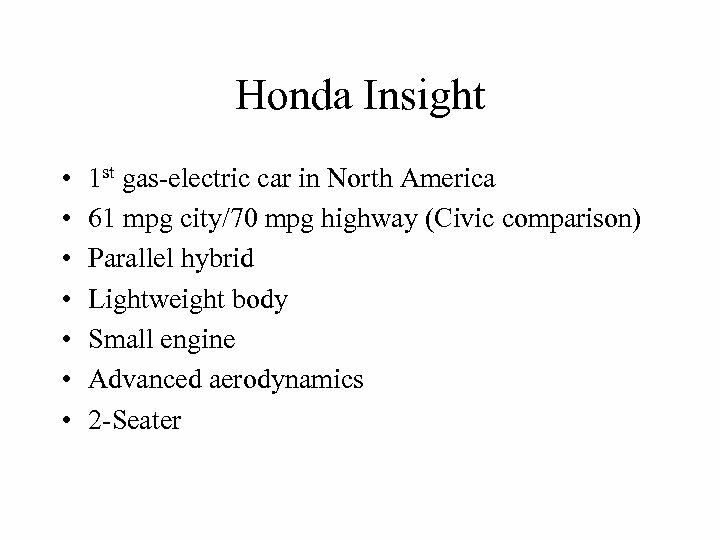 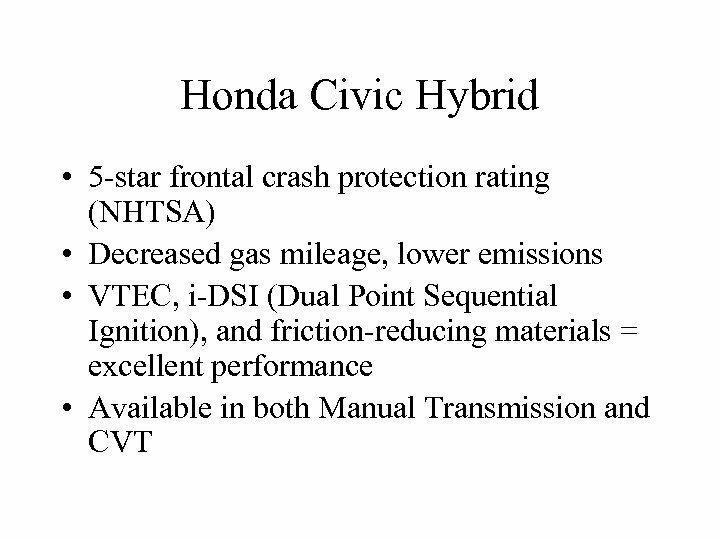 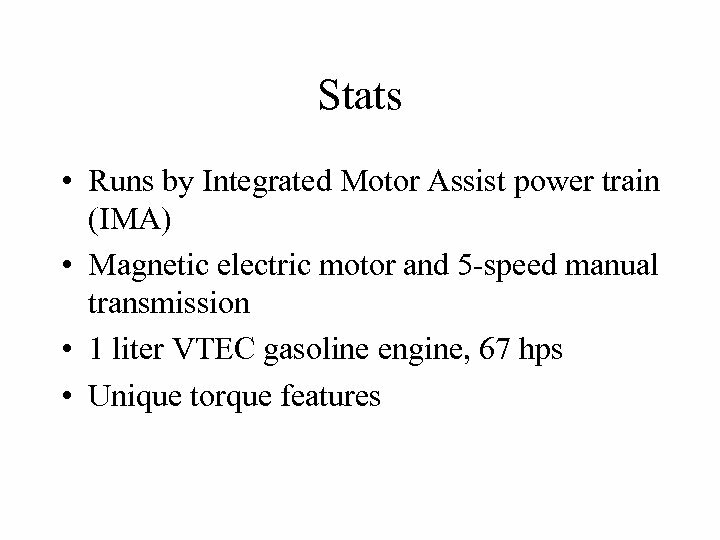 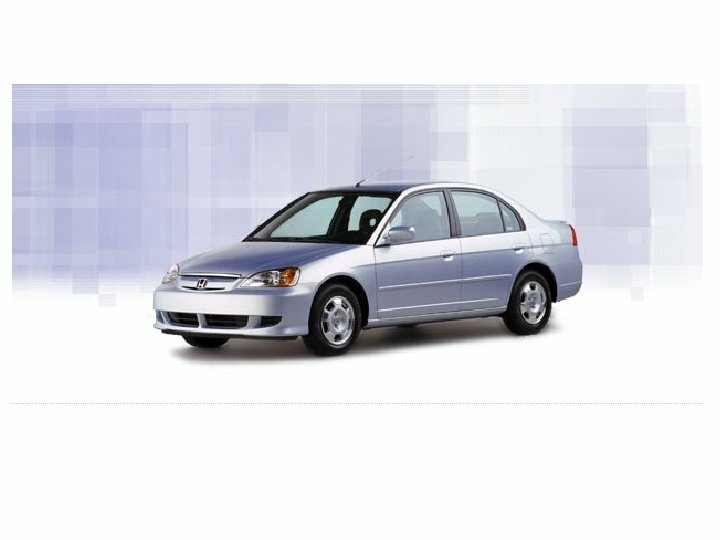 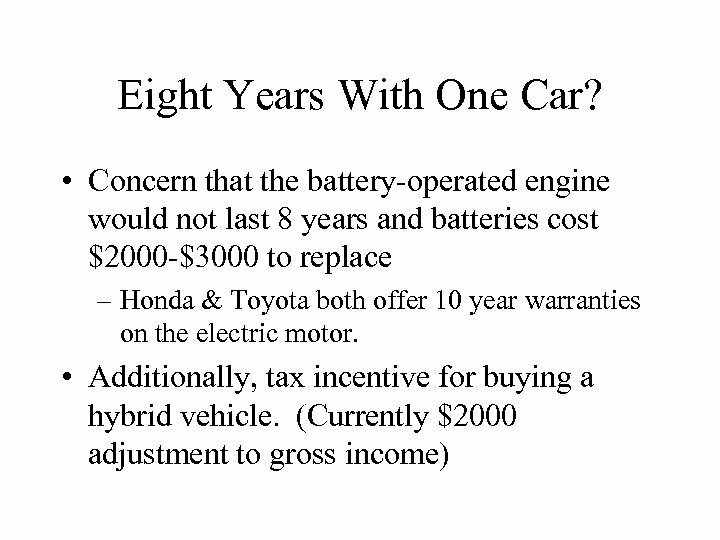 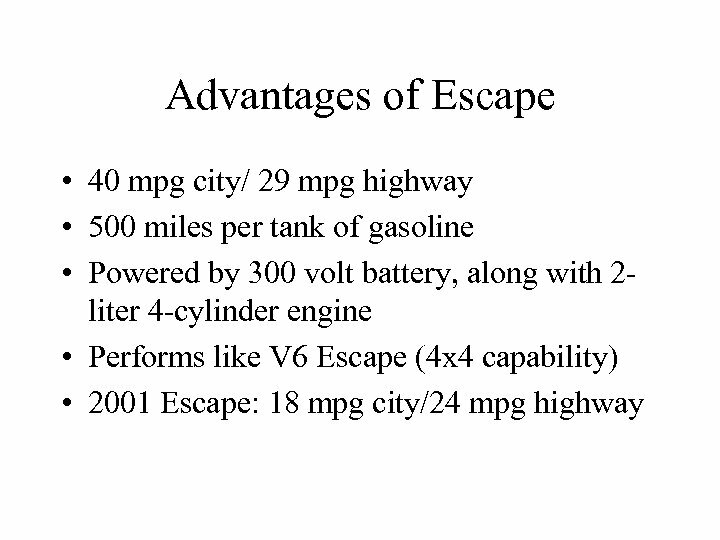 • Both Honda and Toyota offer extended warranties (8 -10 years) on the electric engine.